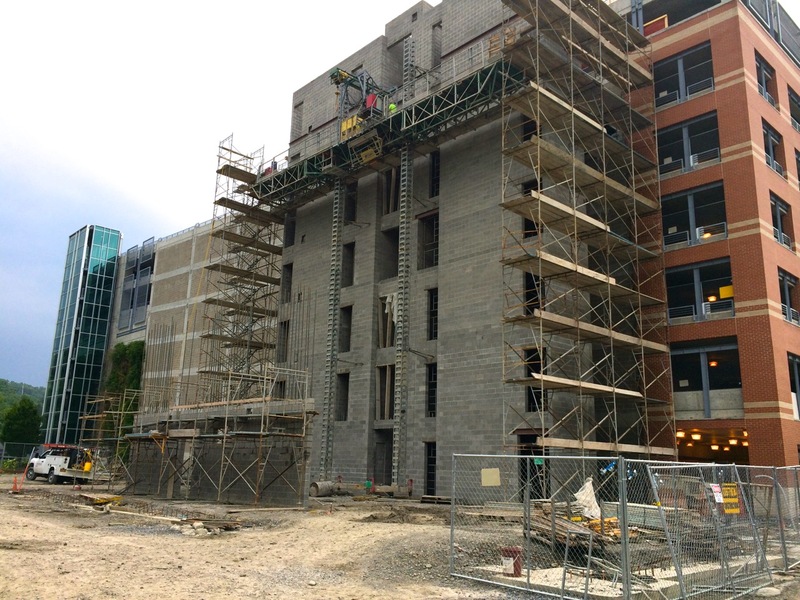 The 7-story, 45-unit, 49,244 GSF Cayuga Place Residences project from Bloomfield/Schon + Partners being constructed by Turnbull-Wahlert Construction out of Cincinnati, Ohio has completed the core section of block walls, and the scaffolding was on its way back down on August 5th (when these were taken) to install steel ledger boards for the floor framing and other prep-framing work before the two stairs and elevator start to be assembled. 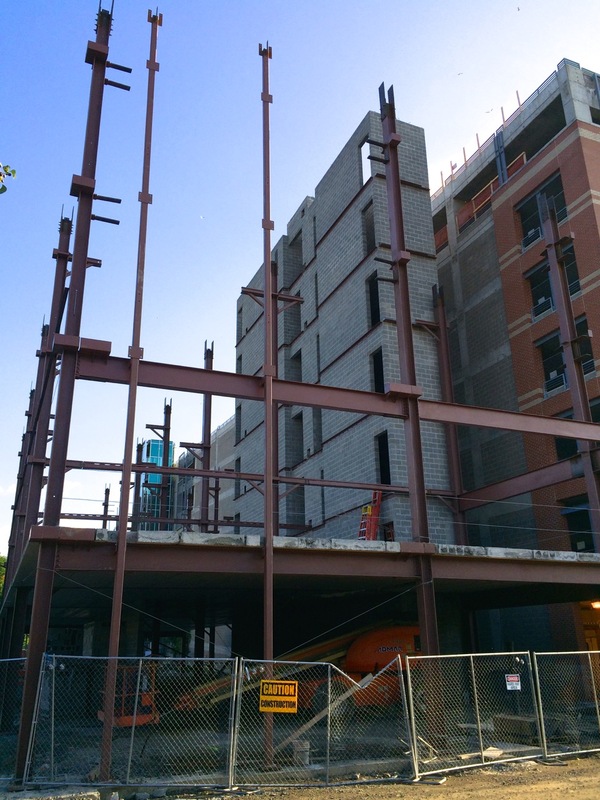 There’s an additional parallel block wall, which will likely be assembled as steel framing makes its way up each level with framing fastened between the core and block wall. 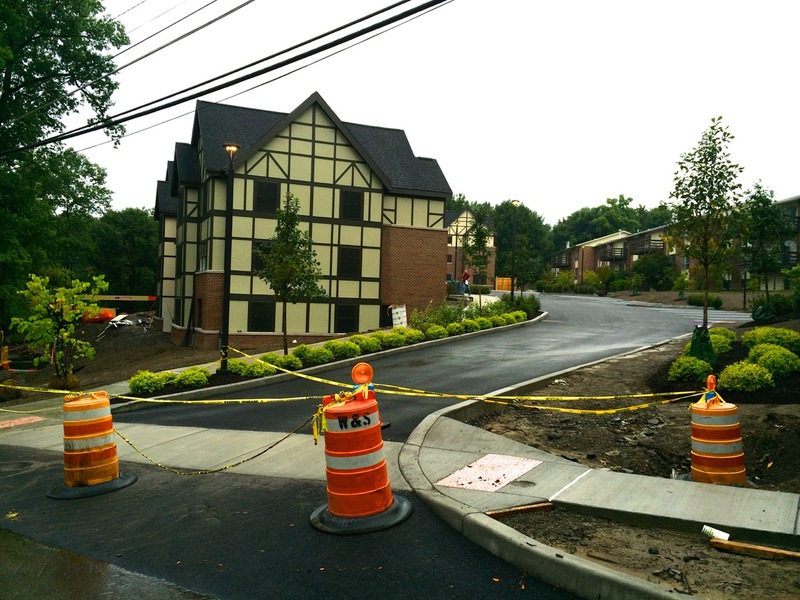 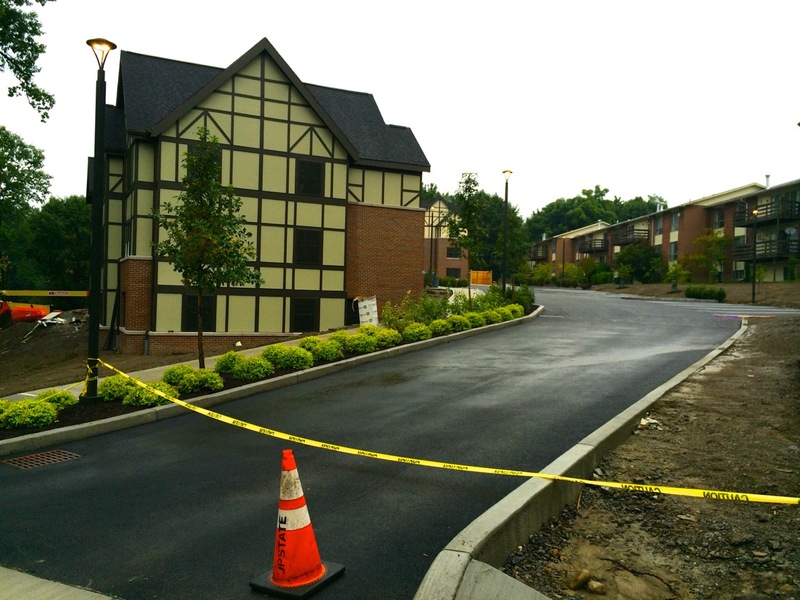 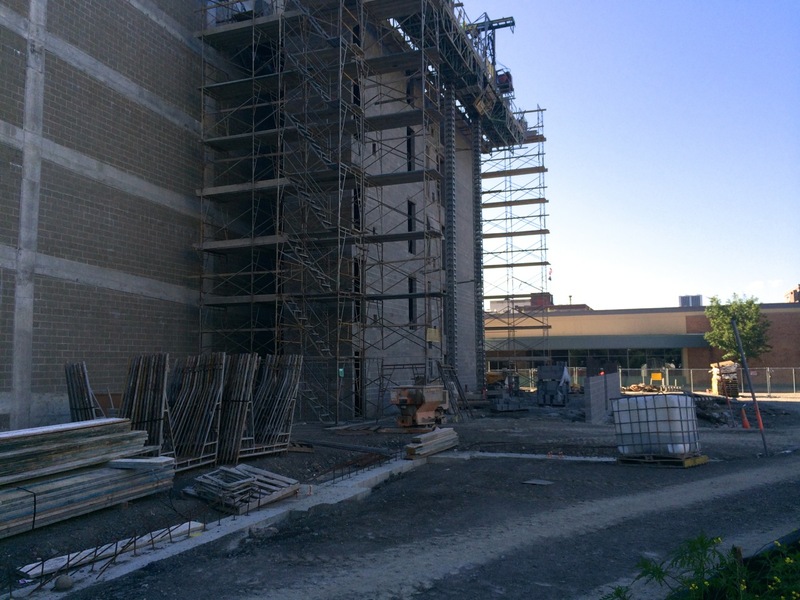 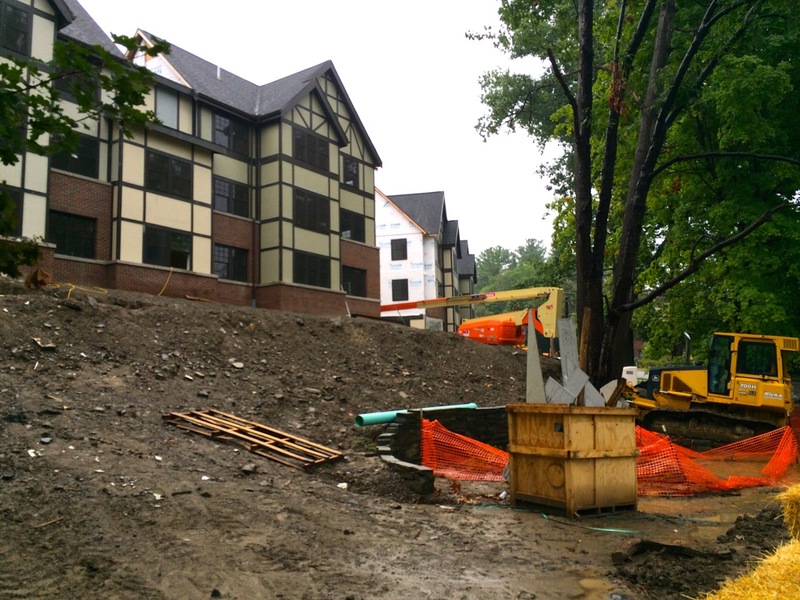 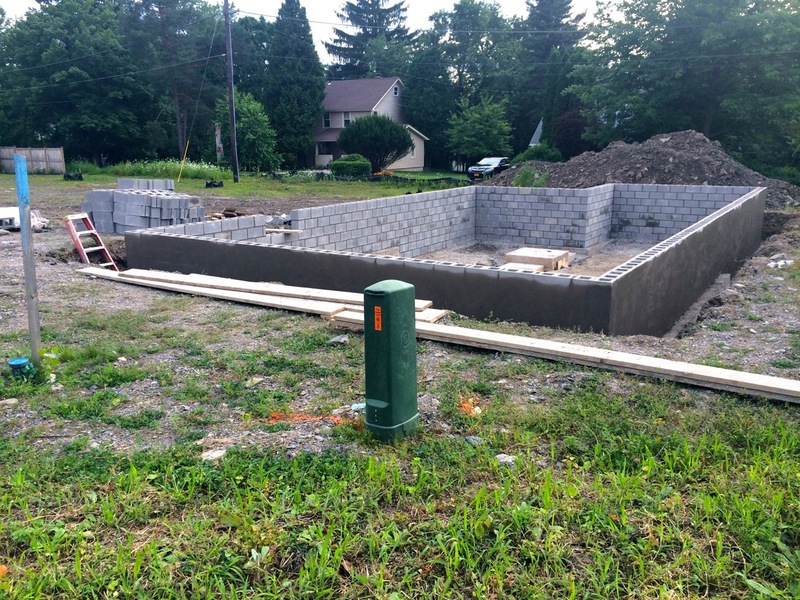 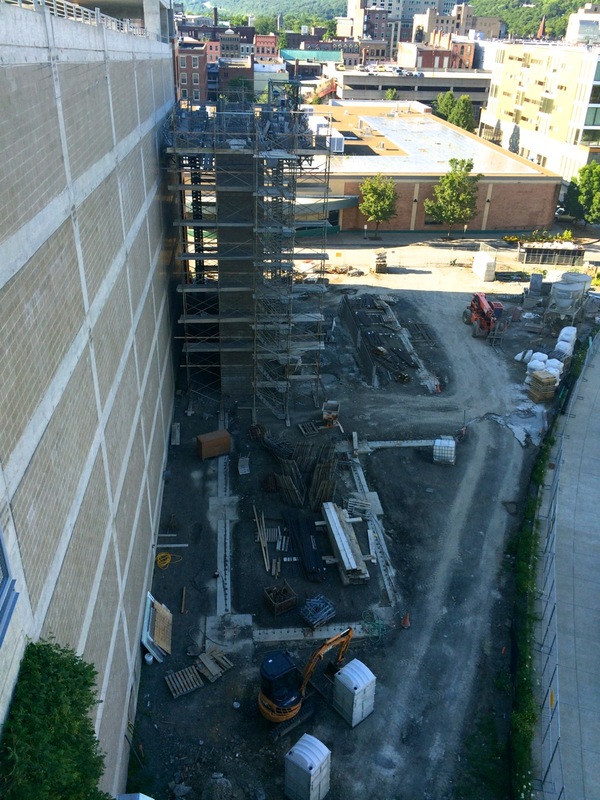 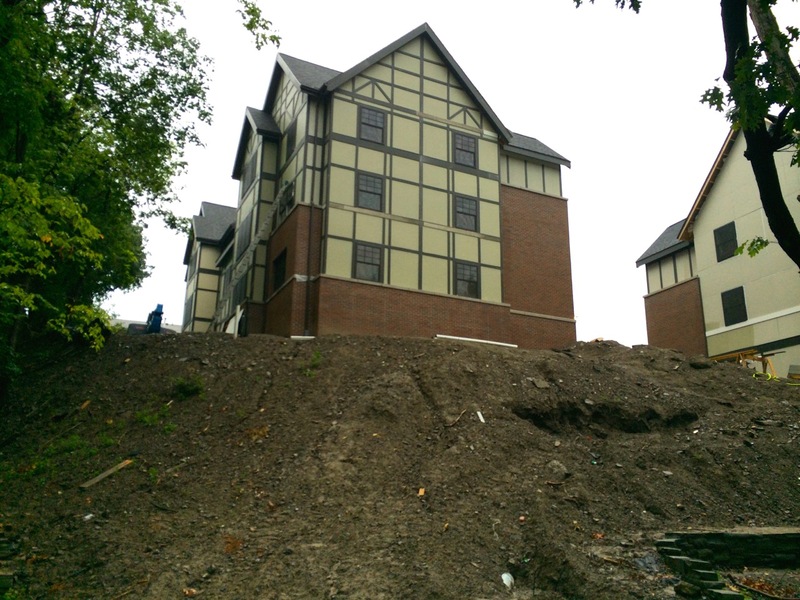 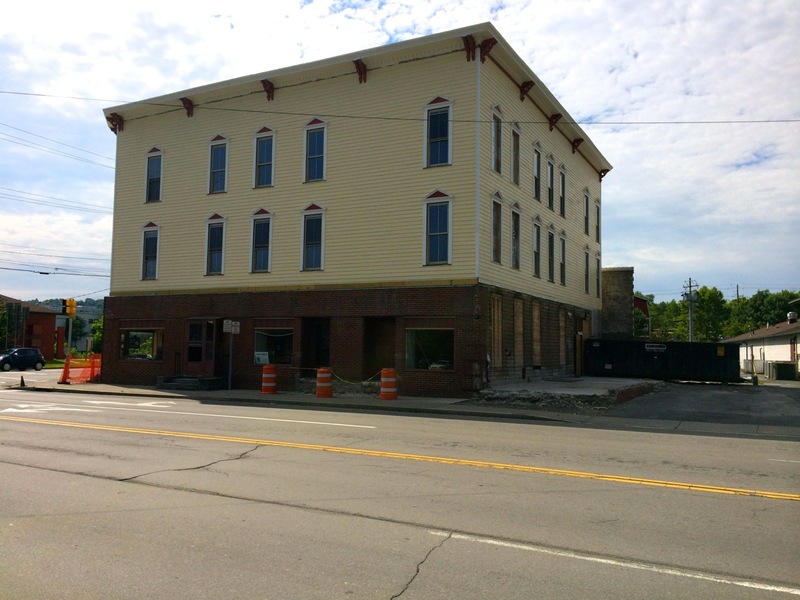 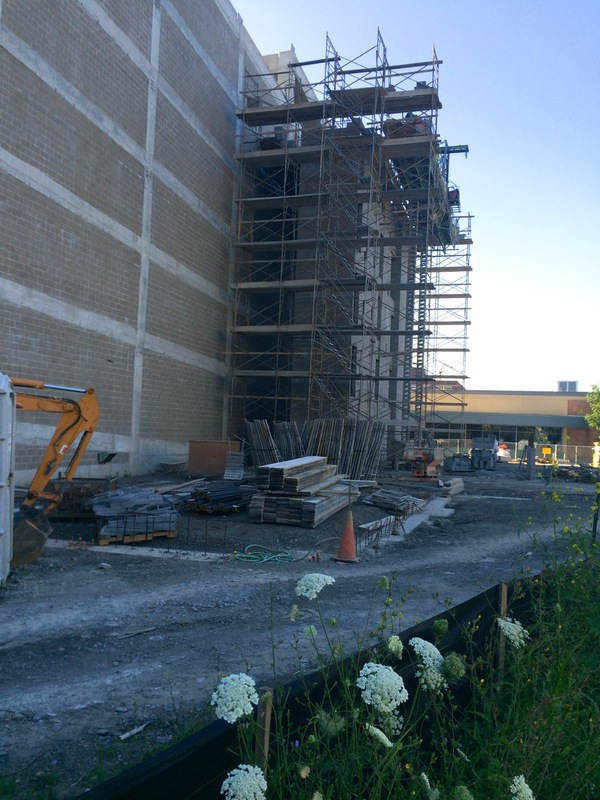 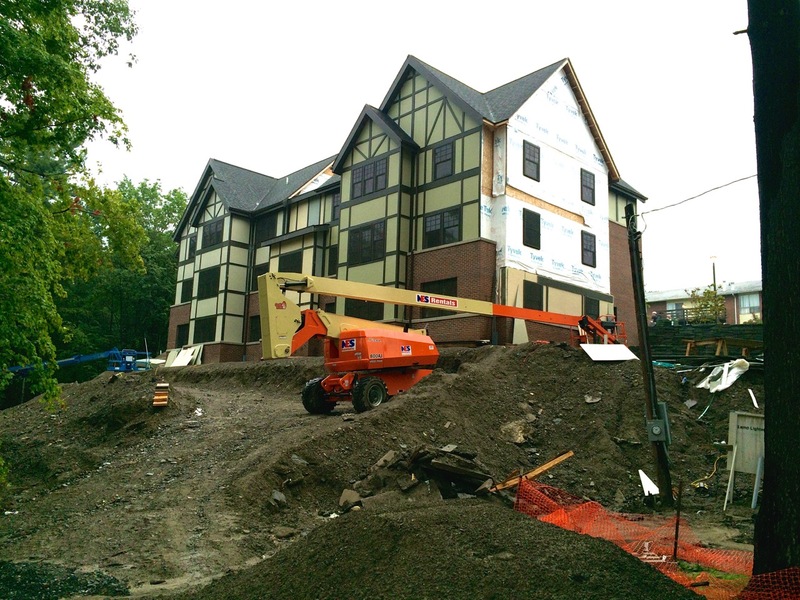 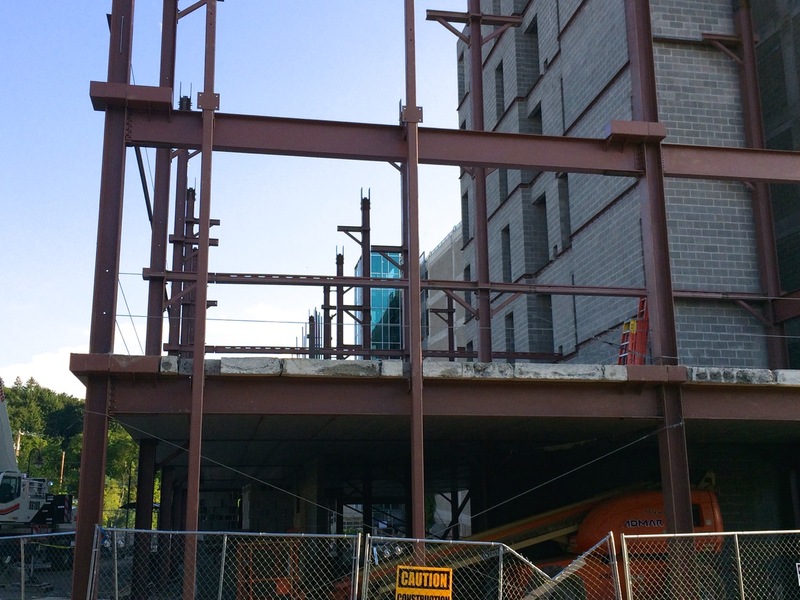 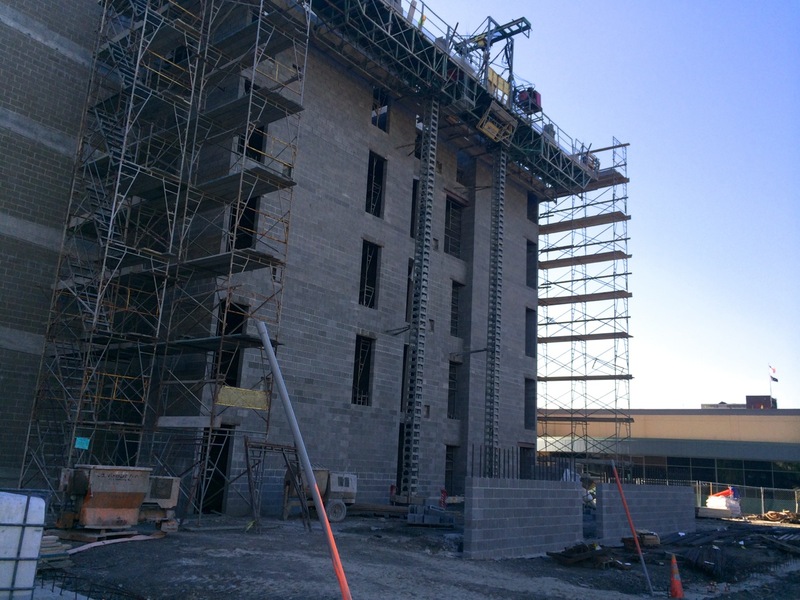 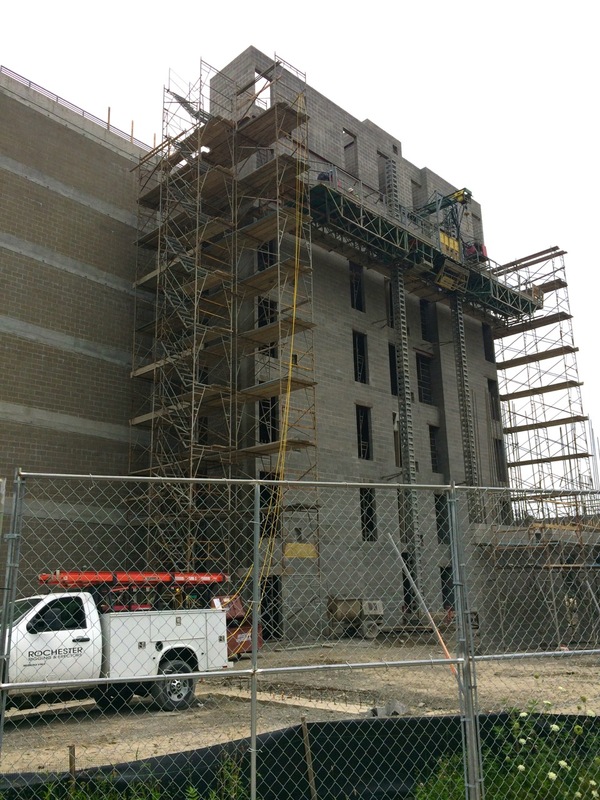 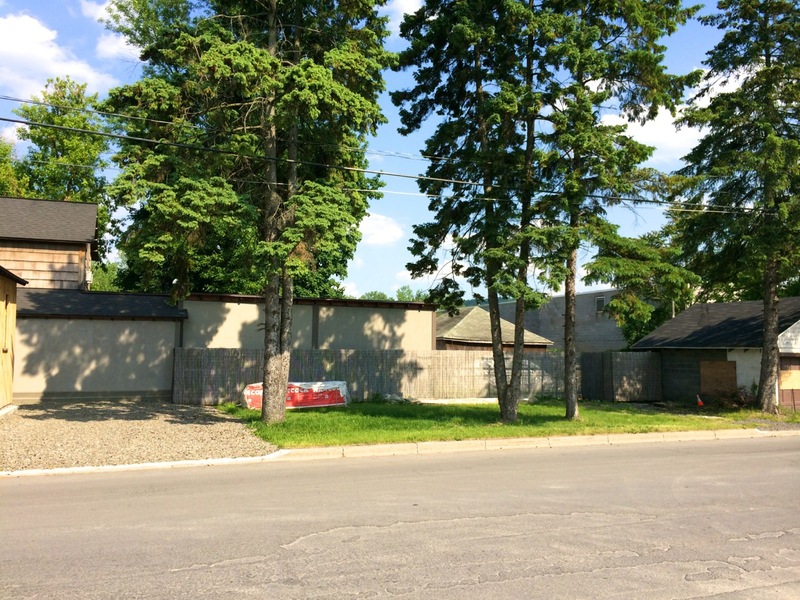 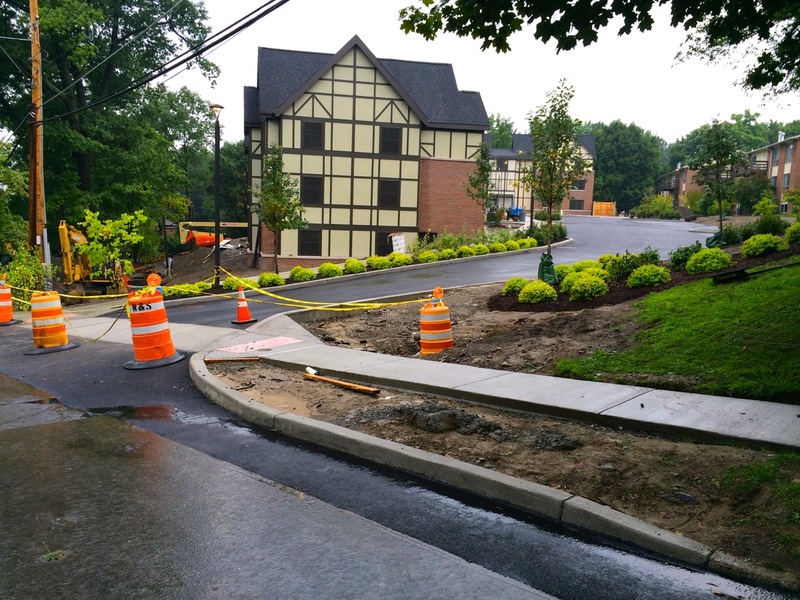 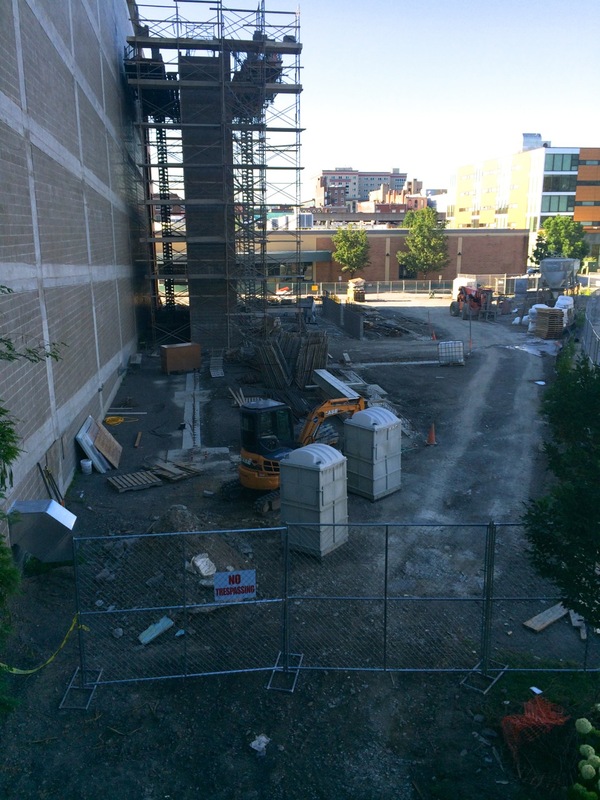 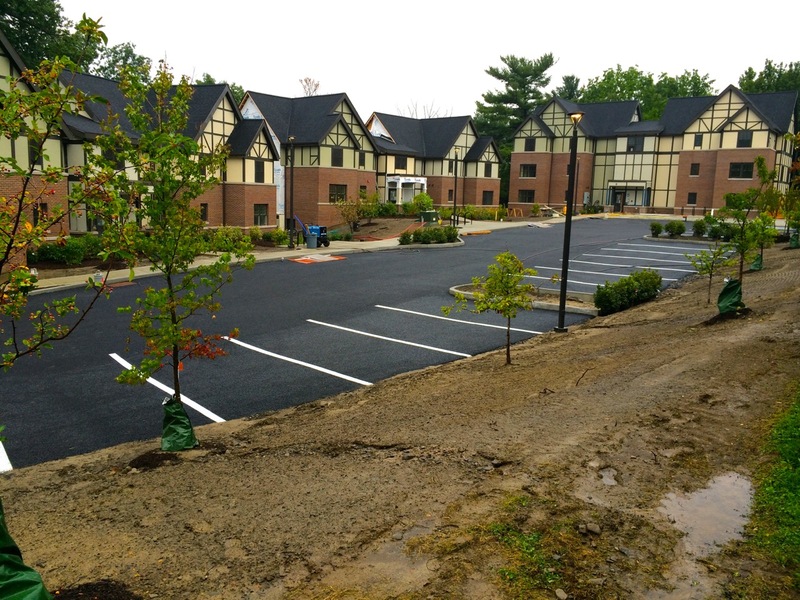 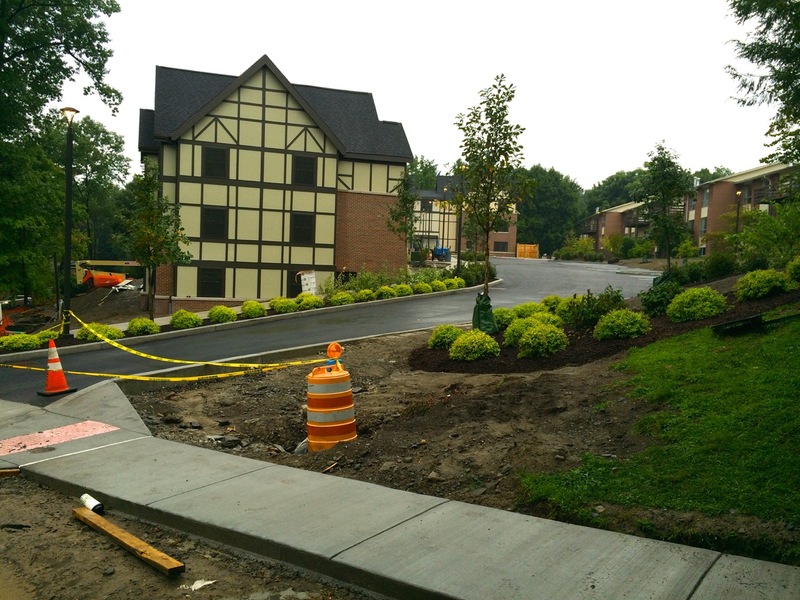 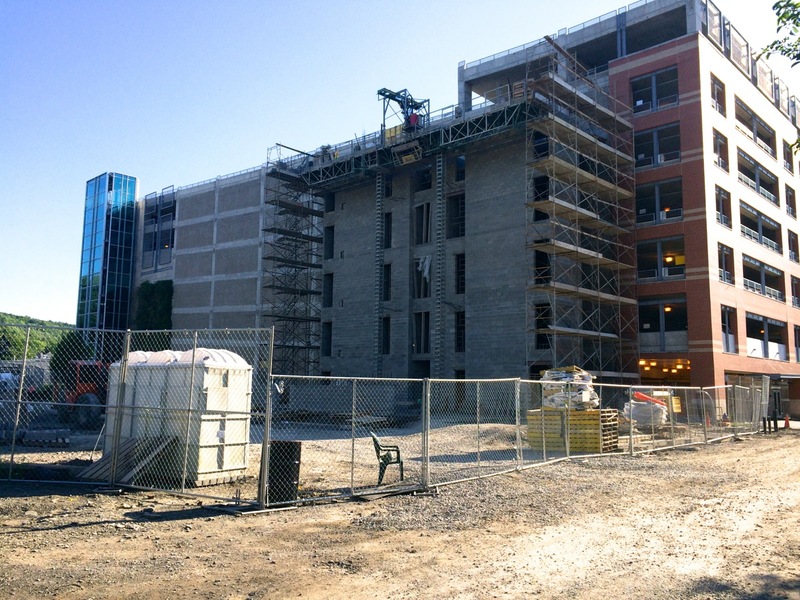 Construction has taken a brisk pace, as the supporting foundation work began early May, and finished-up later on in June, then block work began late June/early July. 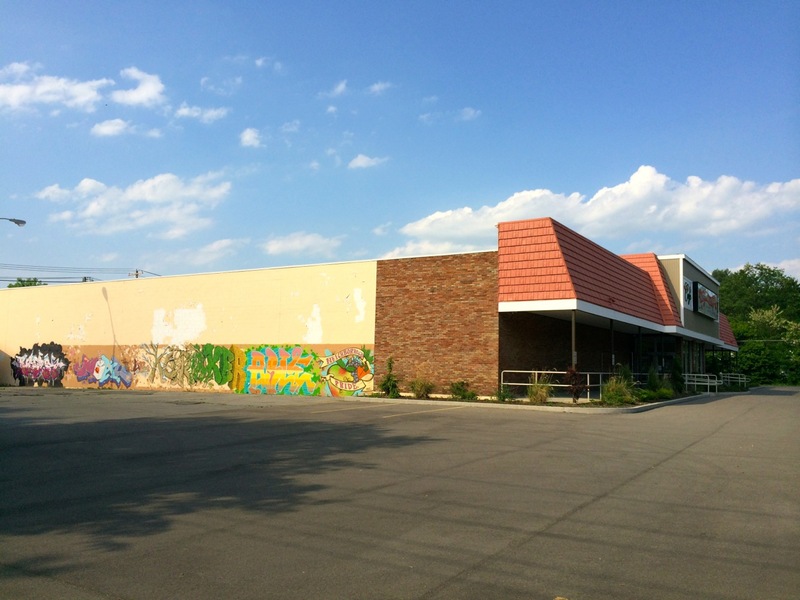 Bloomfield/Schon + Partners is also set to take on a large $20-30 million industrial-reuse project in Cincinnati, at the site of the former Peters Cartridge Factory (14-acre, 250,000 square foot). 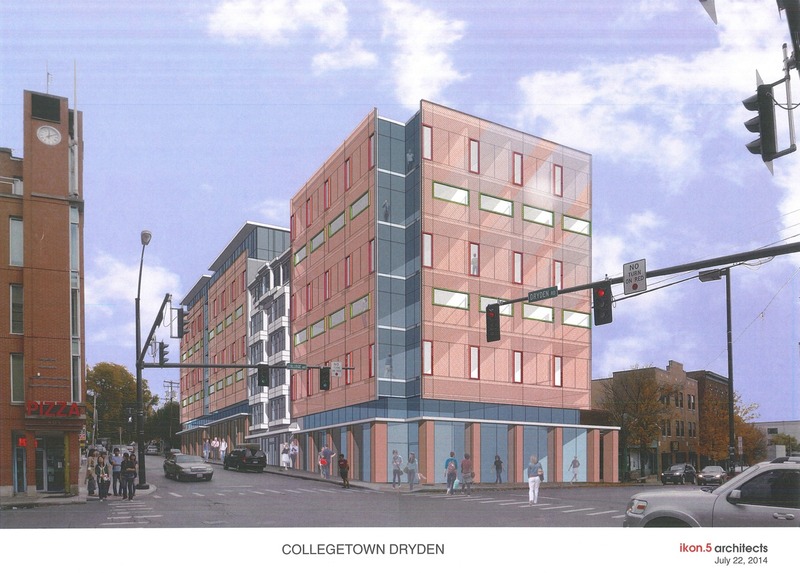 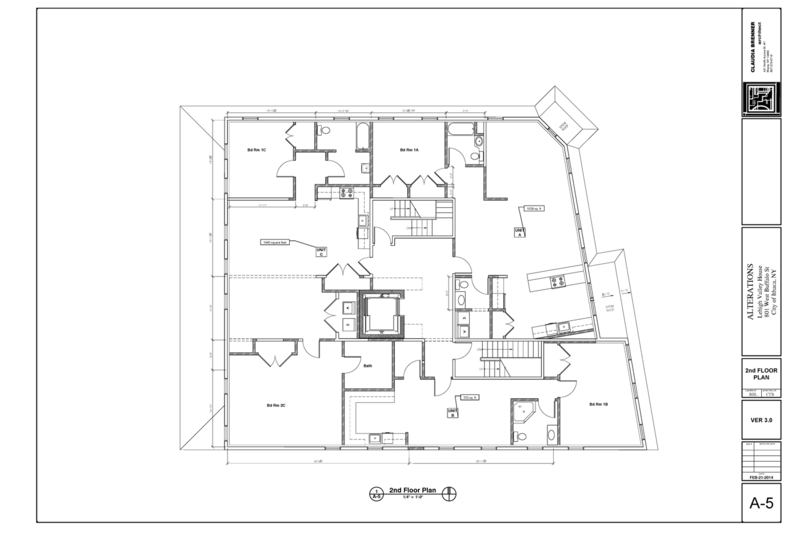 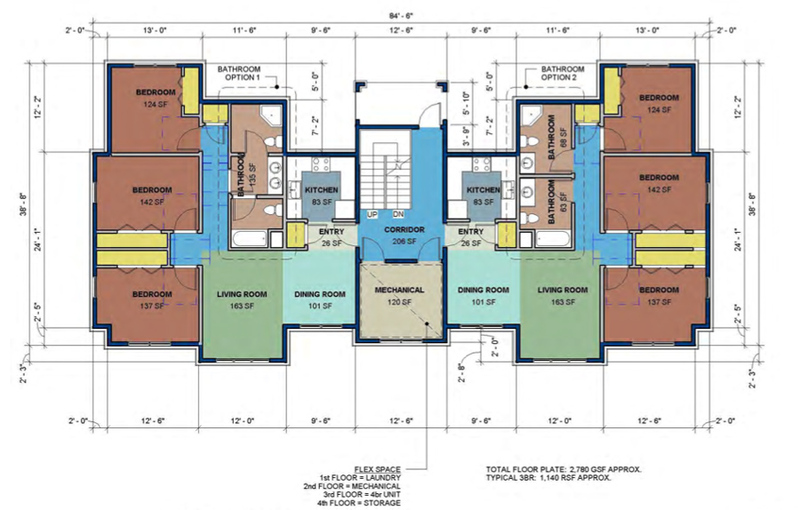 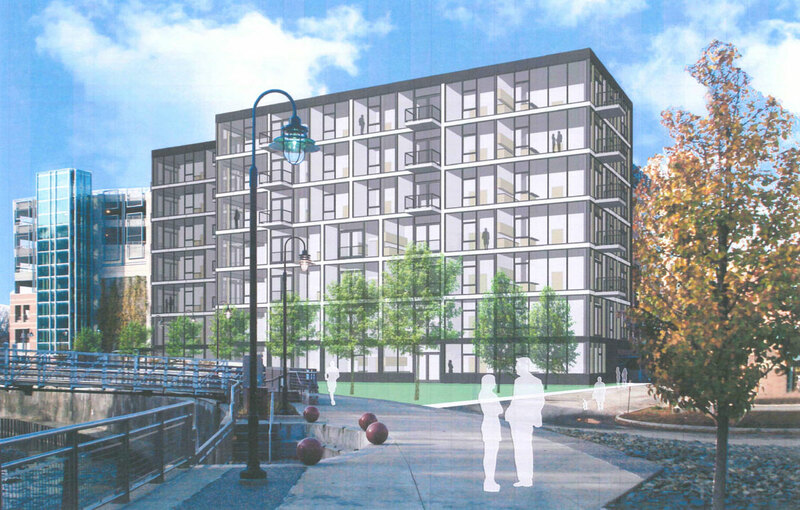 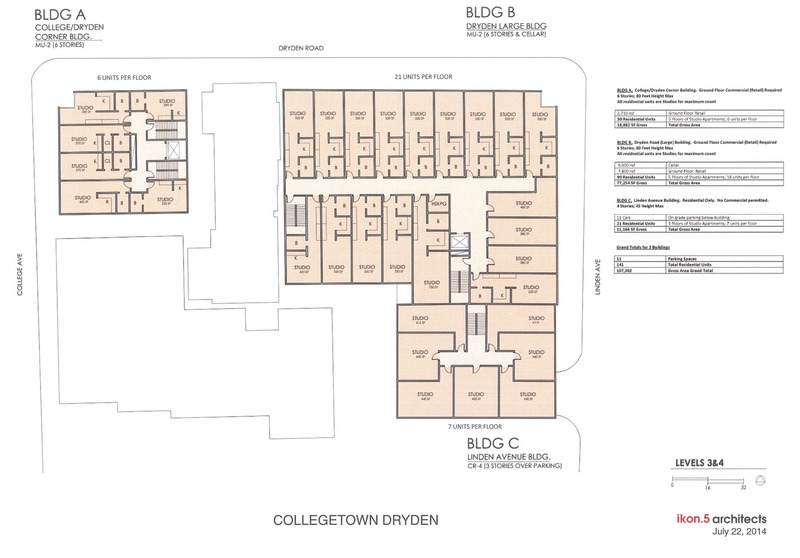 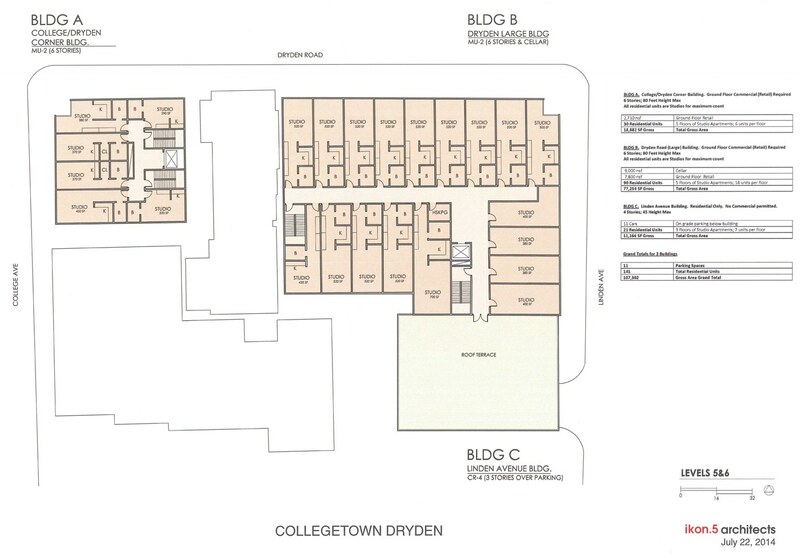 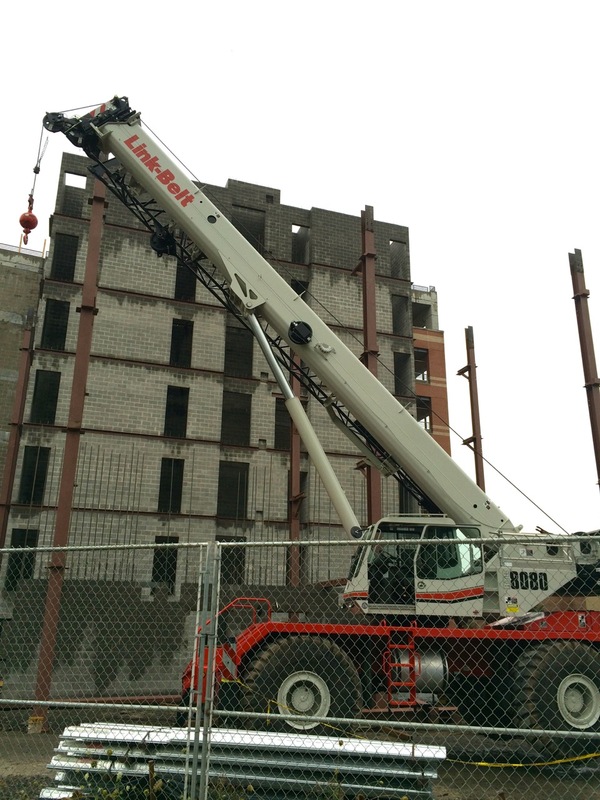 The plan is to clean-up the site, keep the structure, and build-out 100 loft-style apartments. 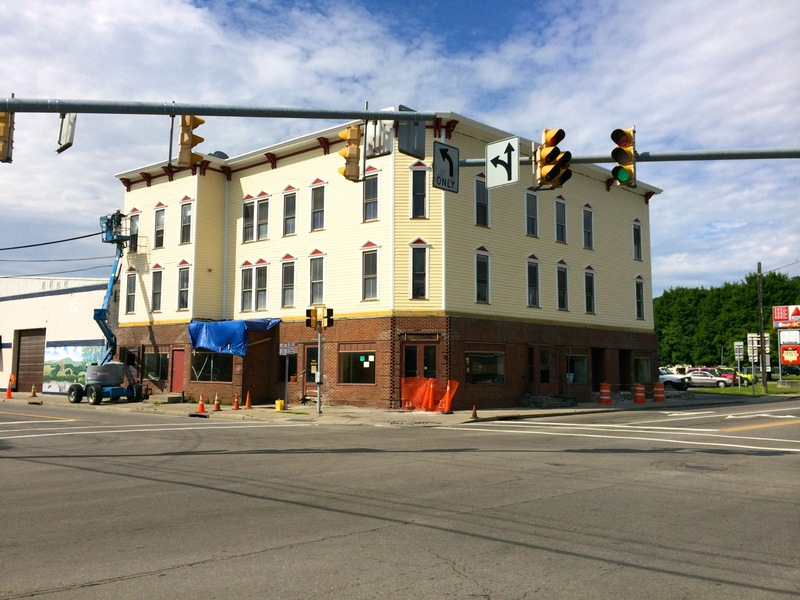 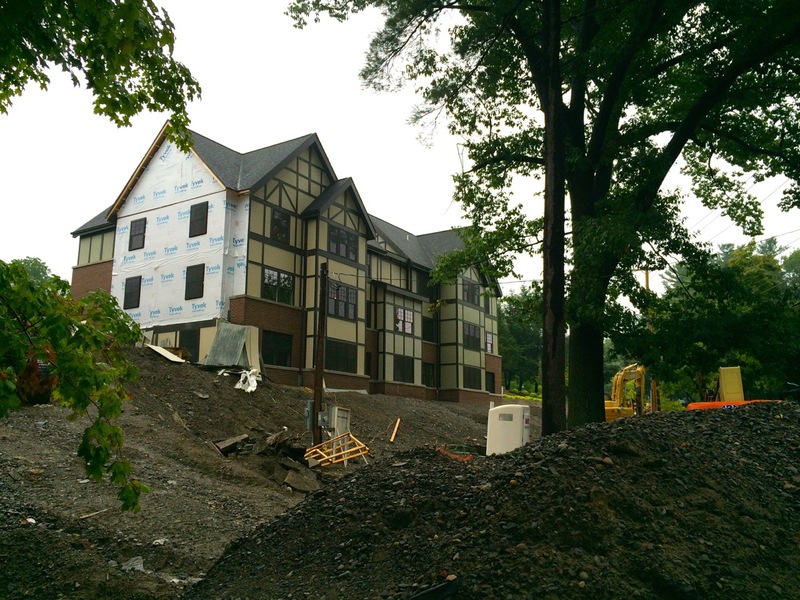 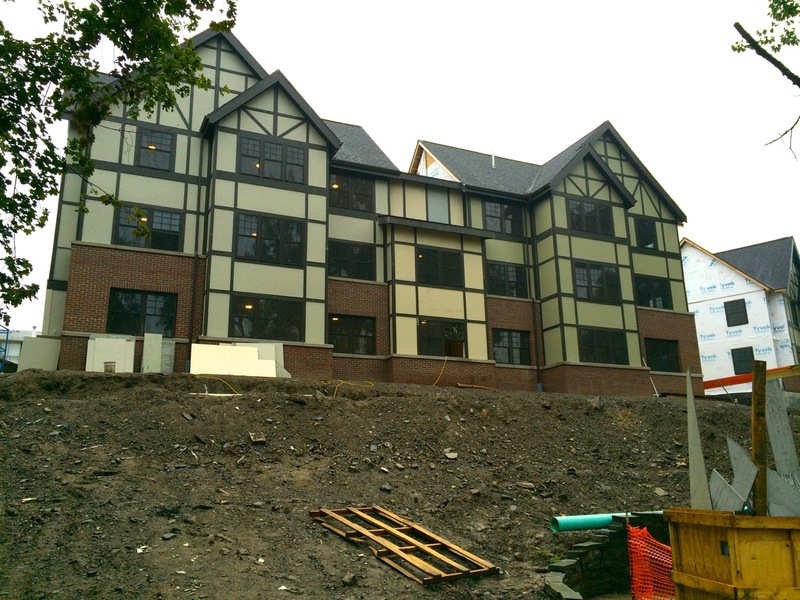 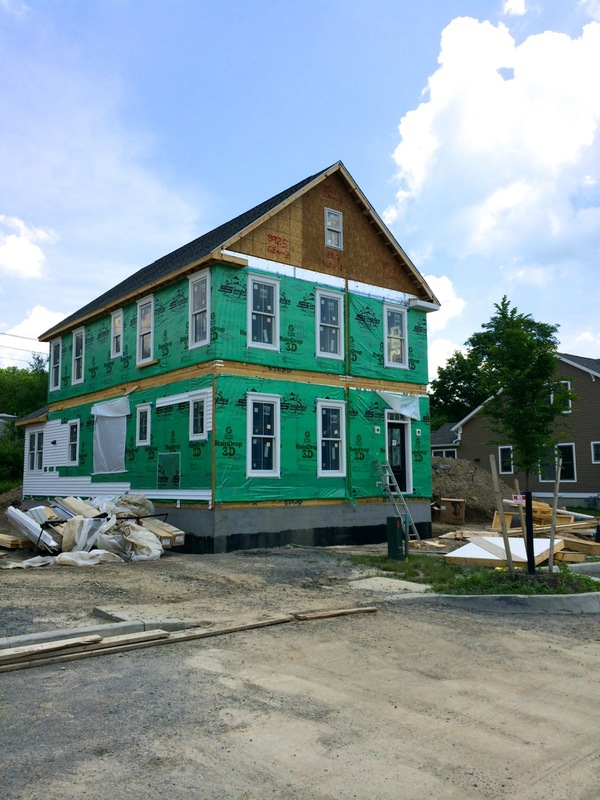 The second and third-story facade for the Lehigh Valley House is nearing completion, and the interior is currently being gutted and renovated for six condominium units on the upper floors (I believe only two remain to be sold), and a few commercial spaces on the ground floor. 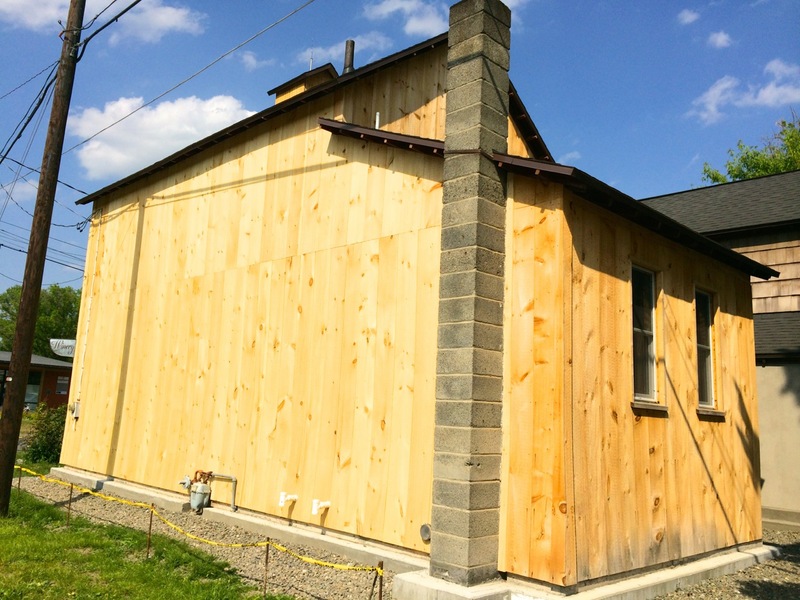 The previous lap wood siding was removed a couple months ago, and fiber cement siding and window trim has been hung and painted in its place. 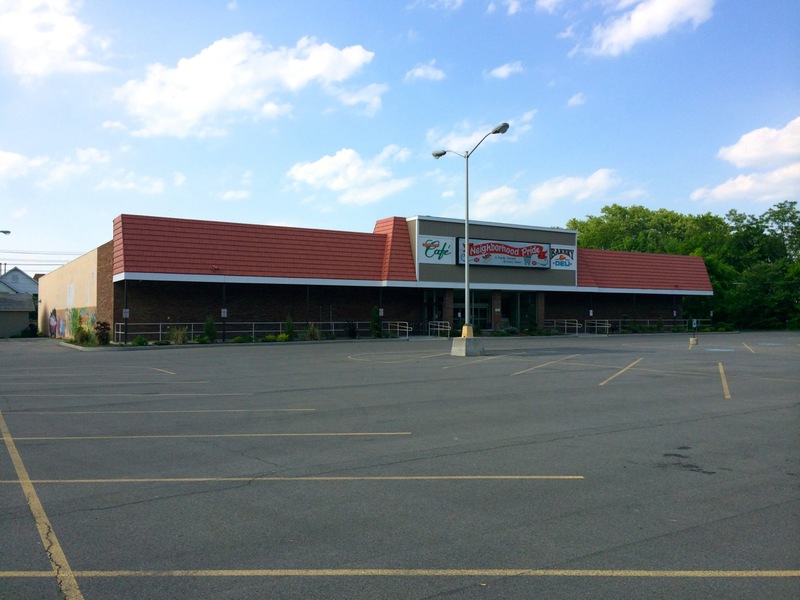 The building is owned by Tim Ciaschi, and is the former home of the Lehigh Valley House Restaurant (previously an Inn as well), which closed in 2010 after 113 years in business. 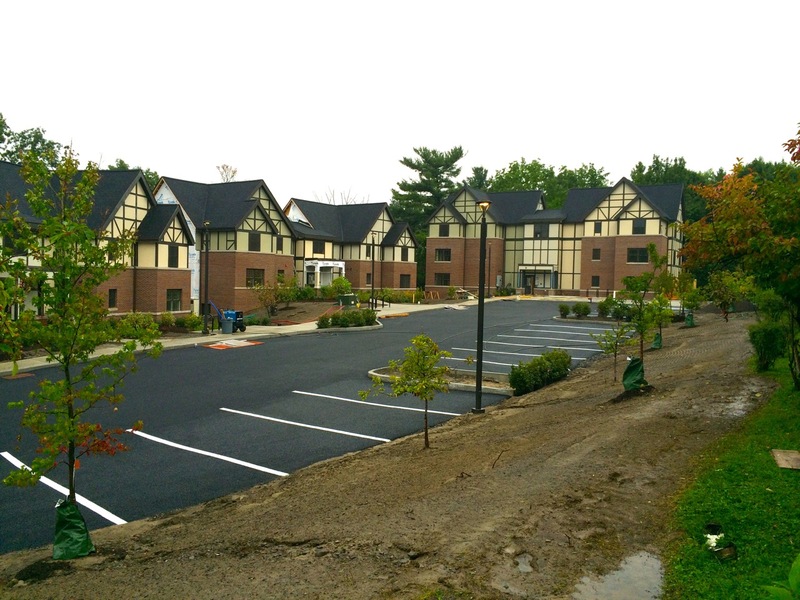 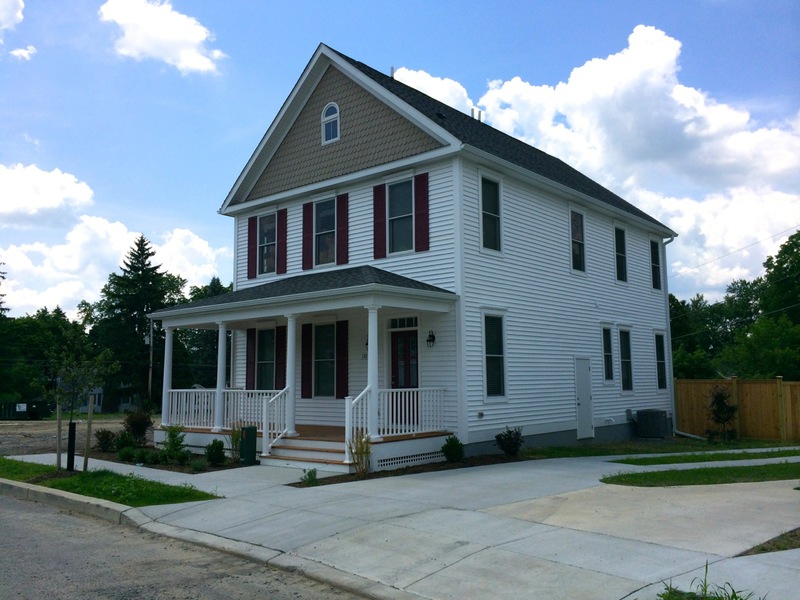 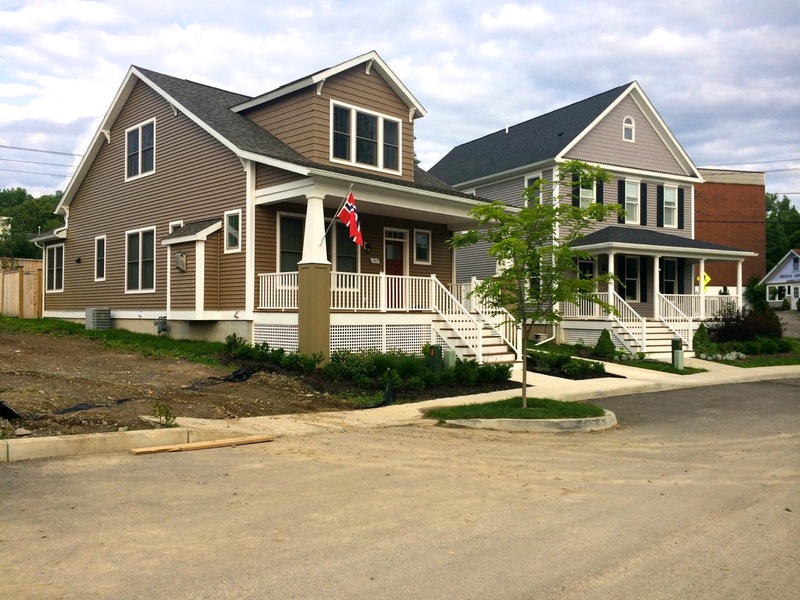 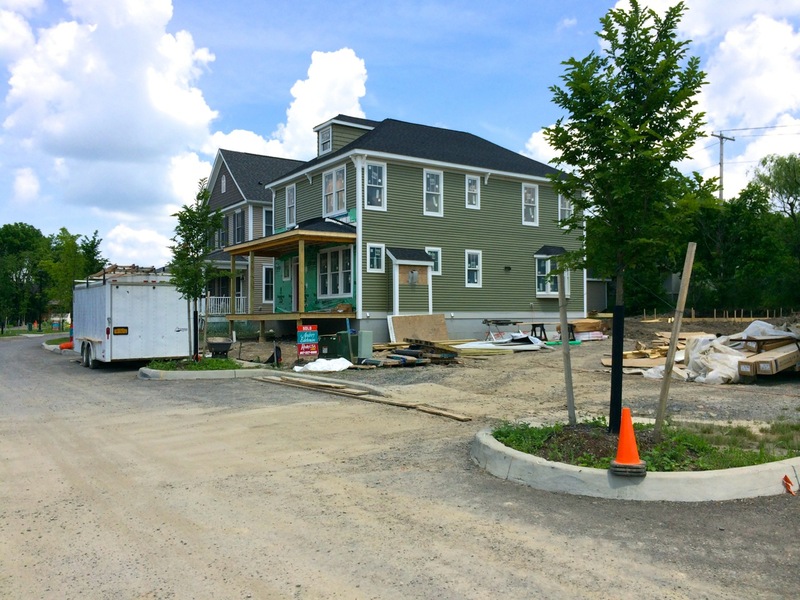 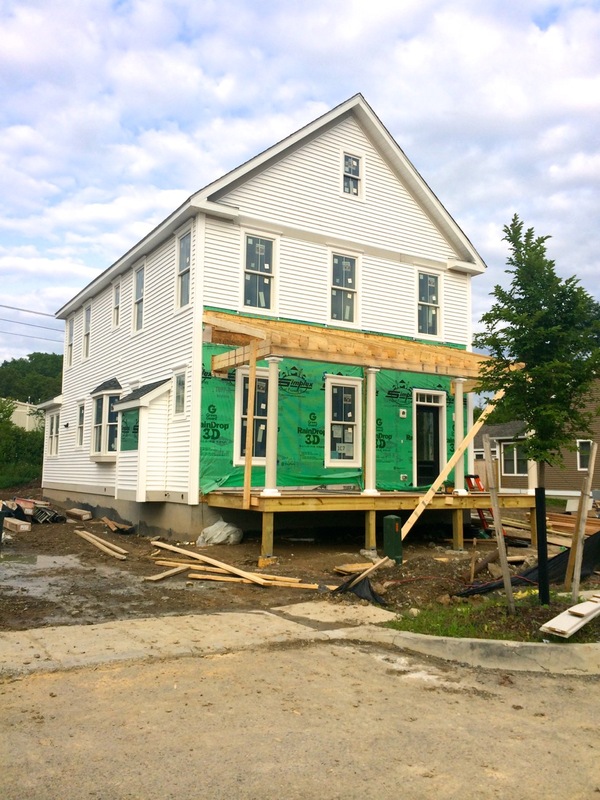 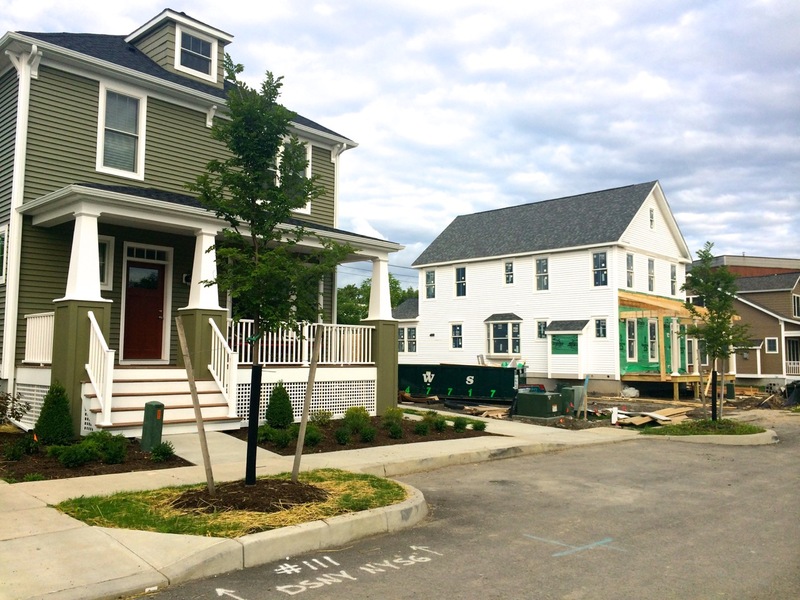 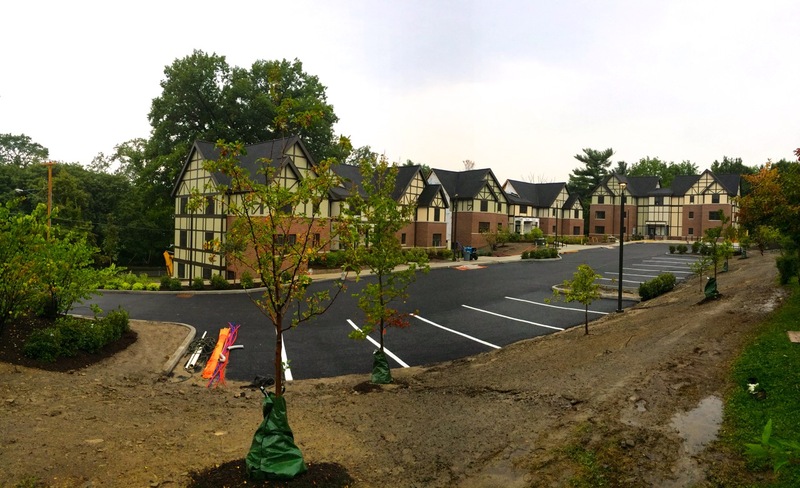 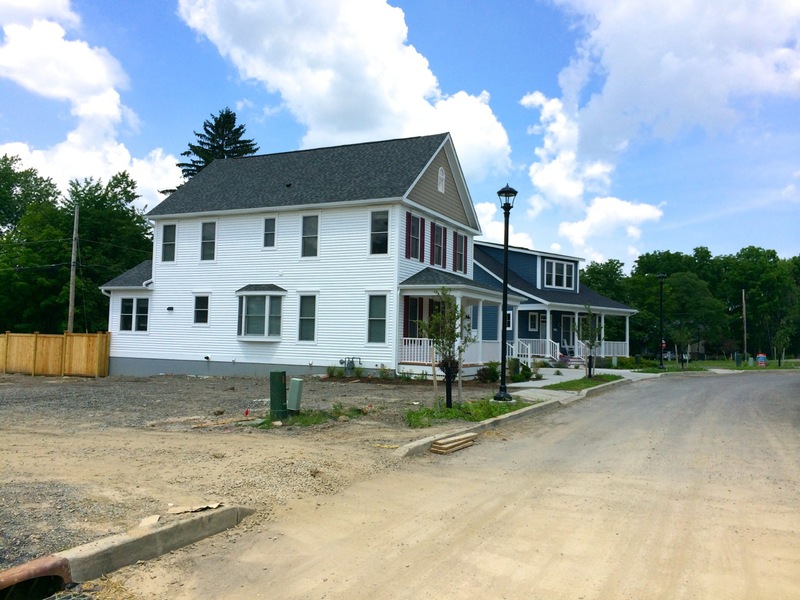 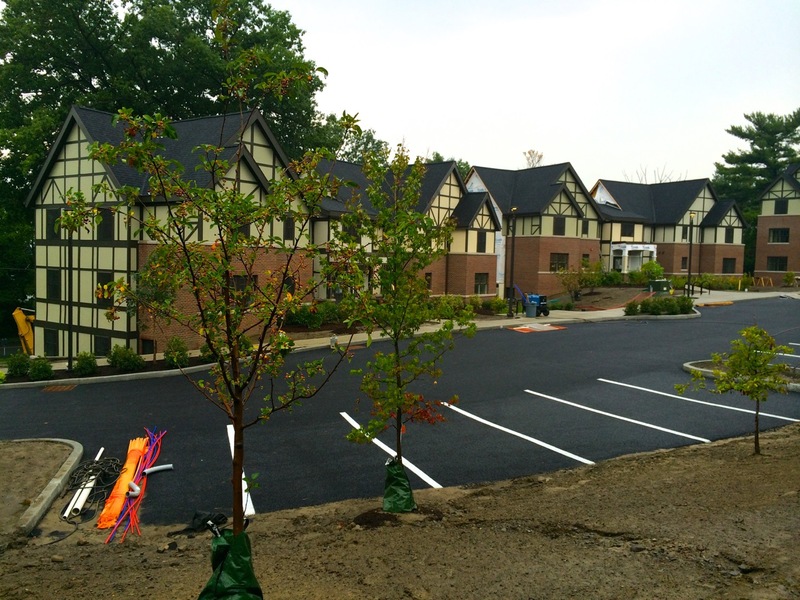 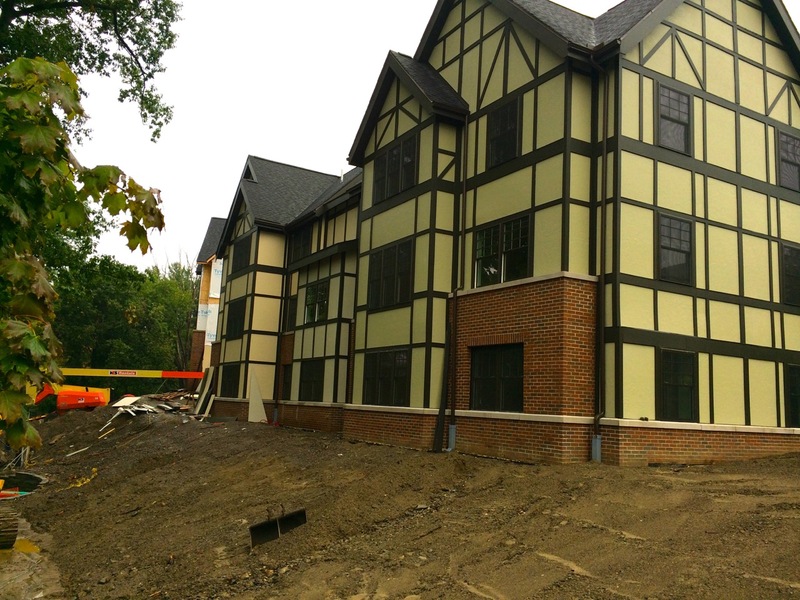 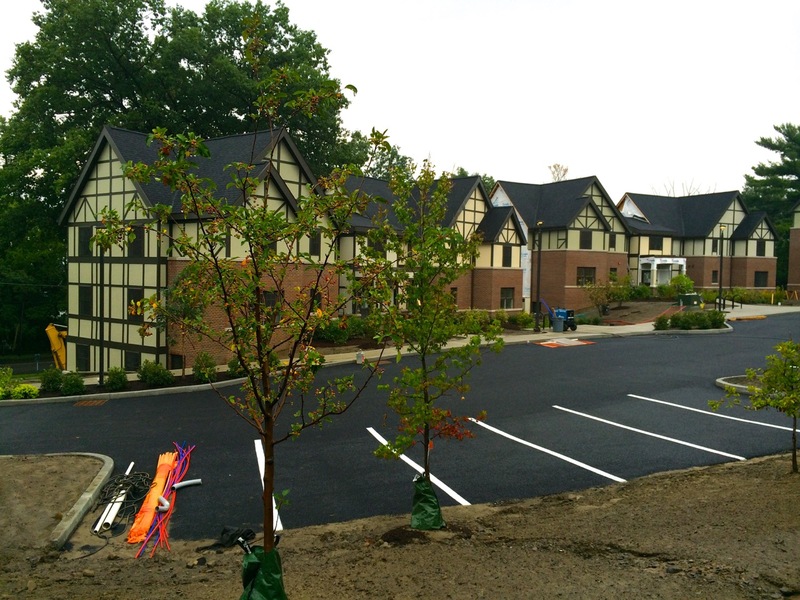 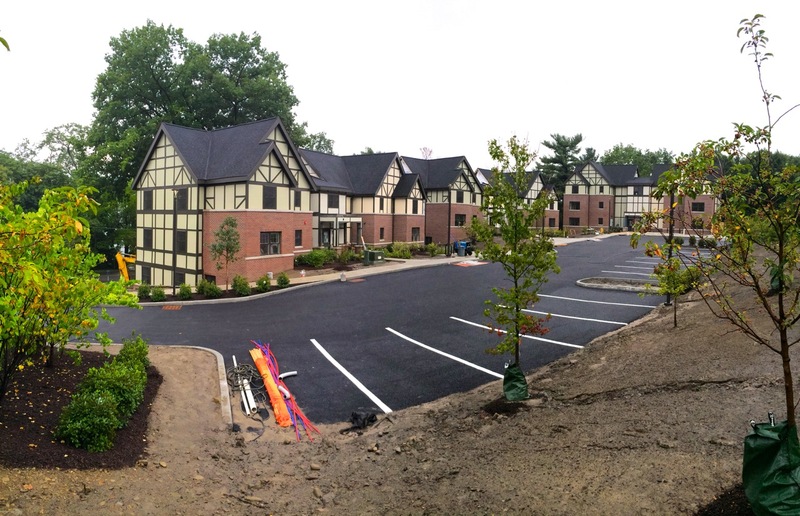 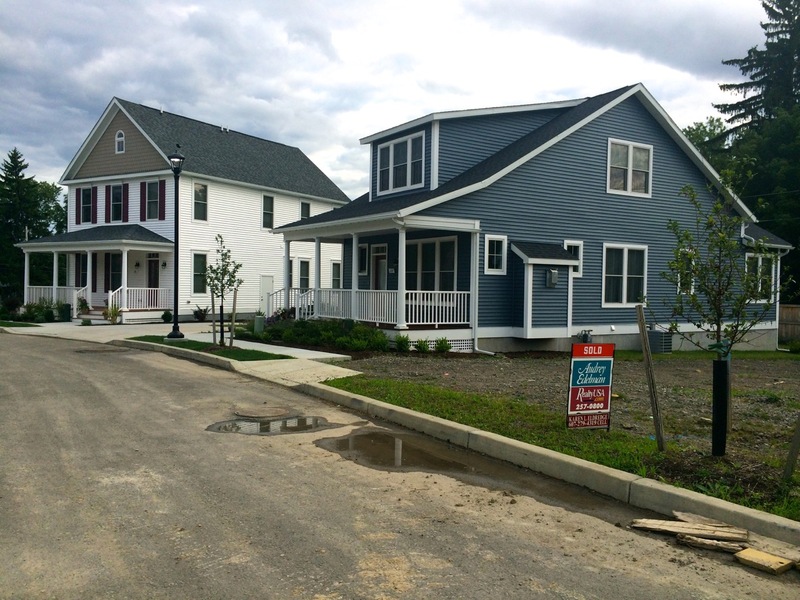 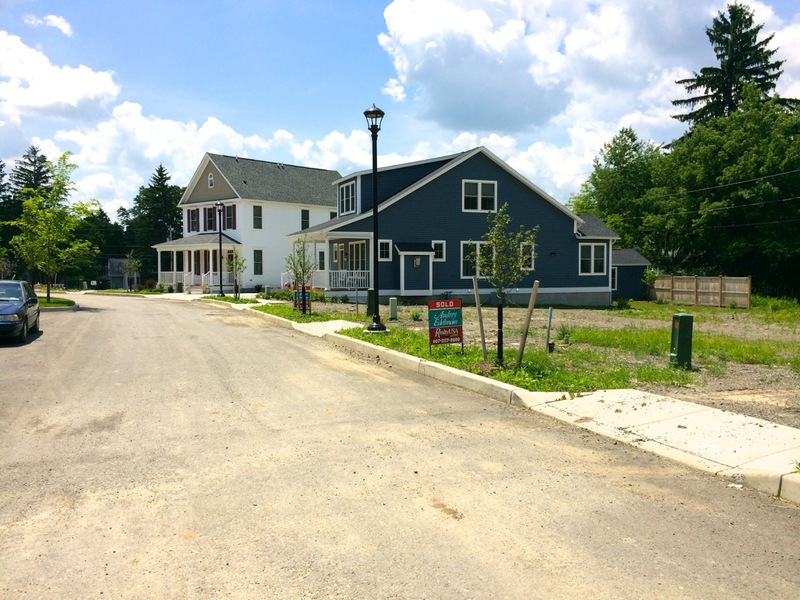 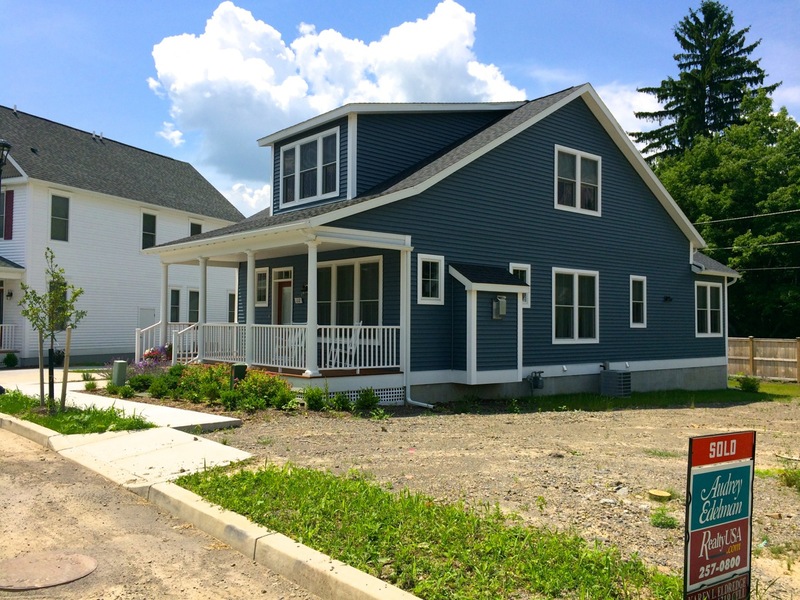 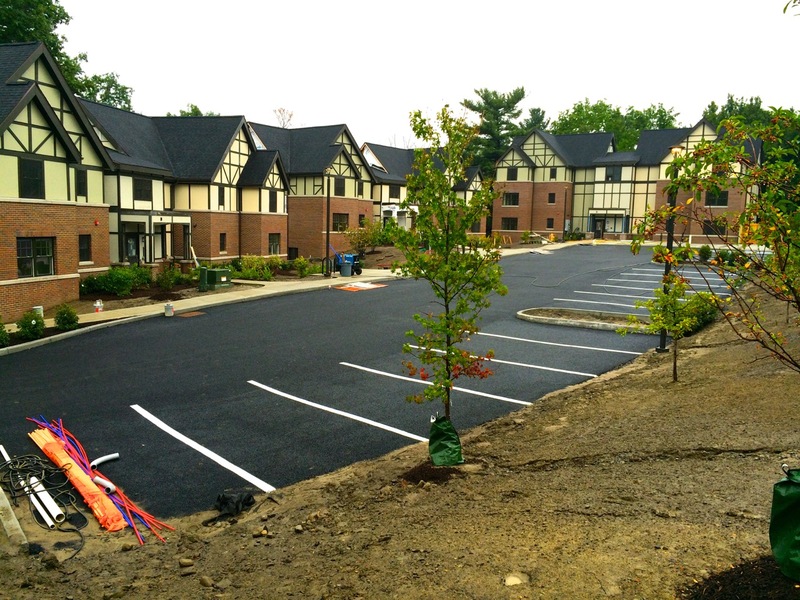 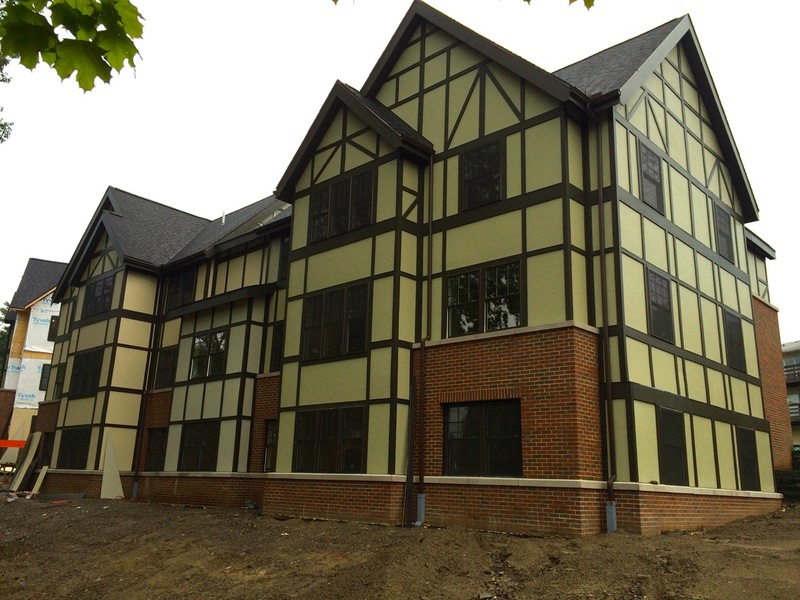 Agora Development‘s 29-home Belle Sherman Cottages project has seen strong sales throughout the winter and this year, and Carina Construction has been working away at new foundations, Simplex modular placements and finish work for four lots since early this year. 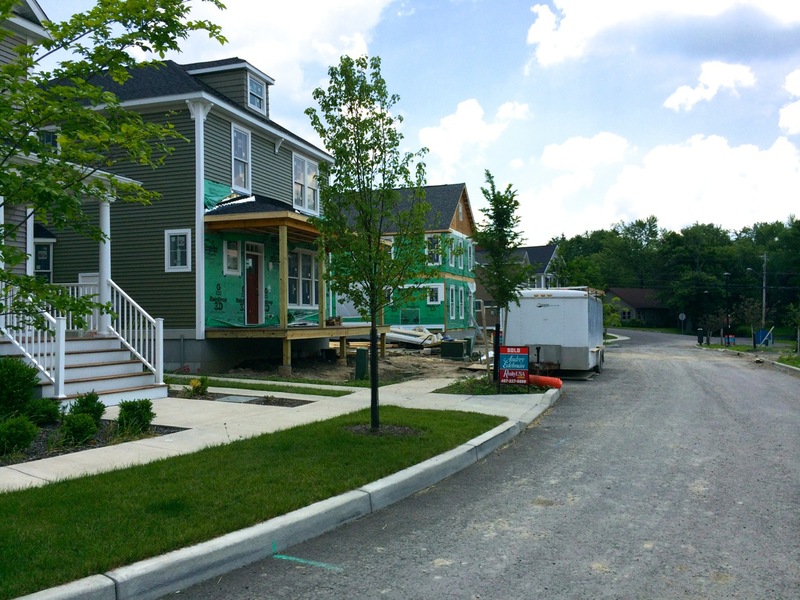 Lots 4 and 6 are being completed as Lot 18’s foundation awaits four Craftsman-style modular pieces to be delivered and craned into place. 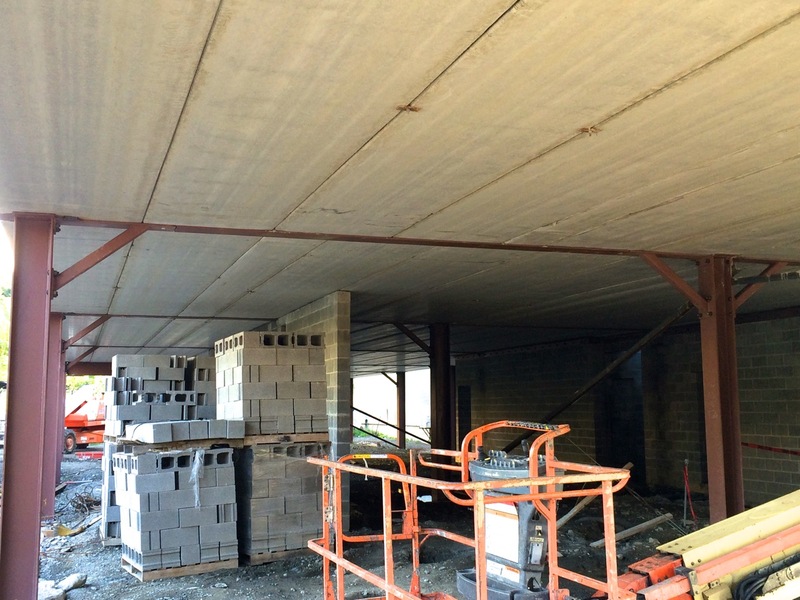 The four pieces are set, levelled and fitted together with steel plates all in one day, then the custom interior work begins (fixtures, finishes, flooring, etc. 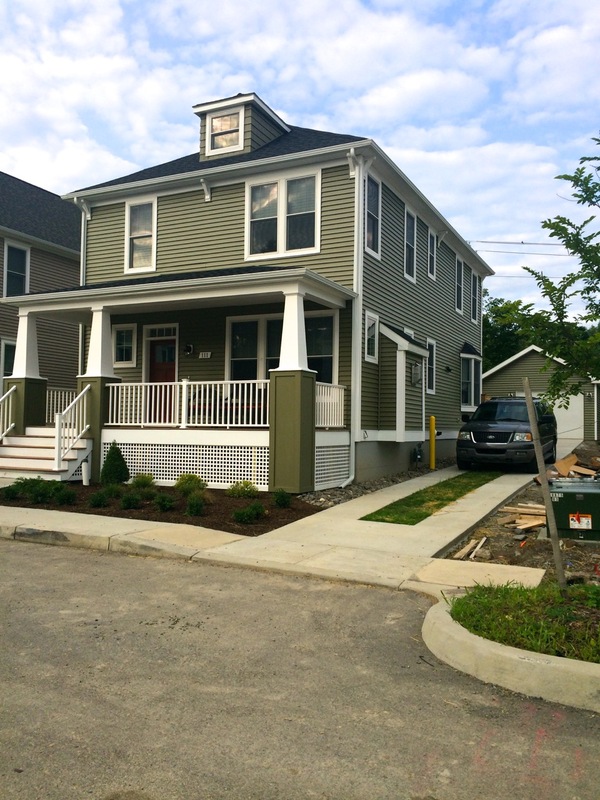 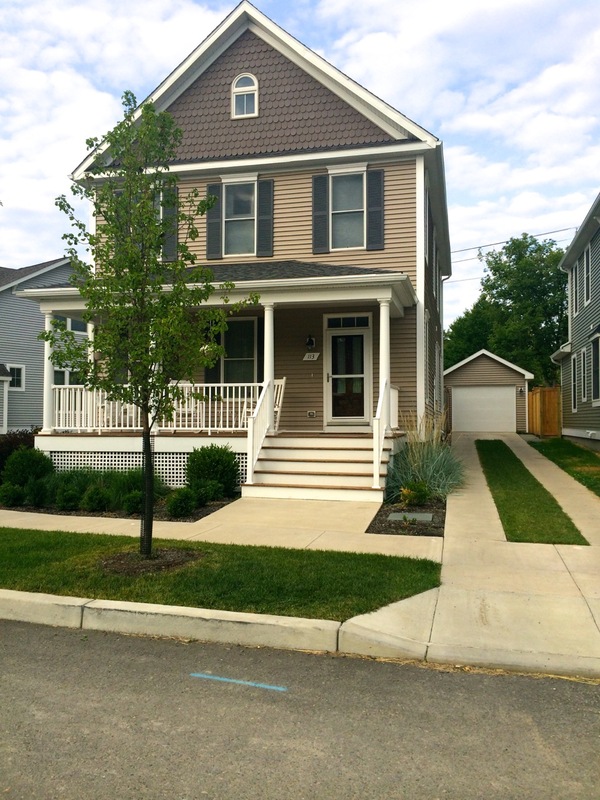 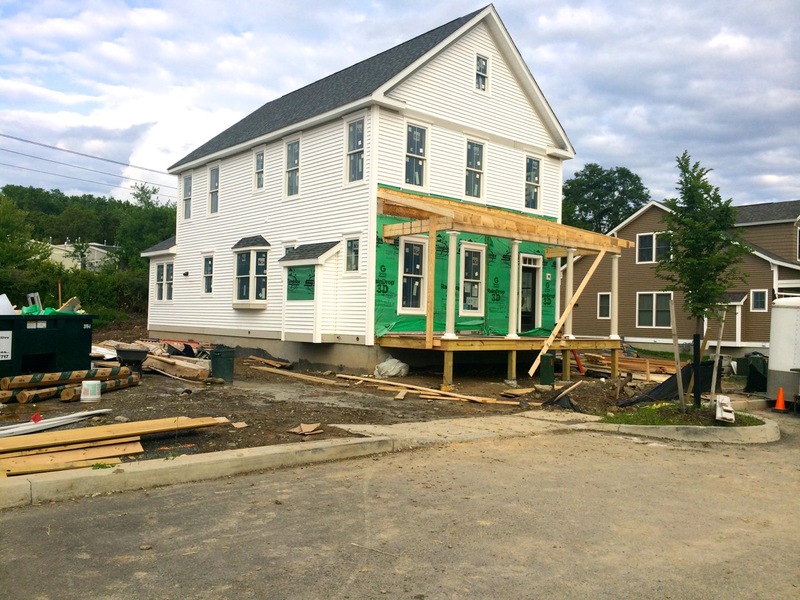 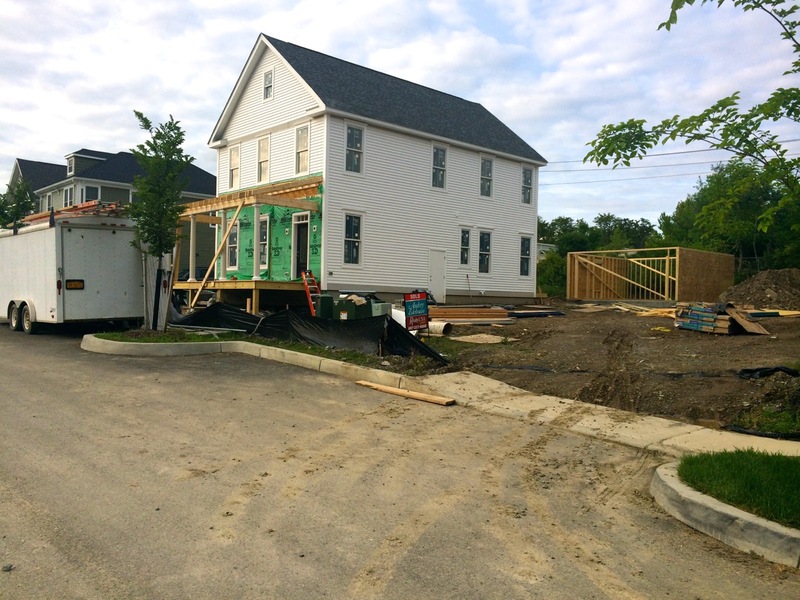 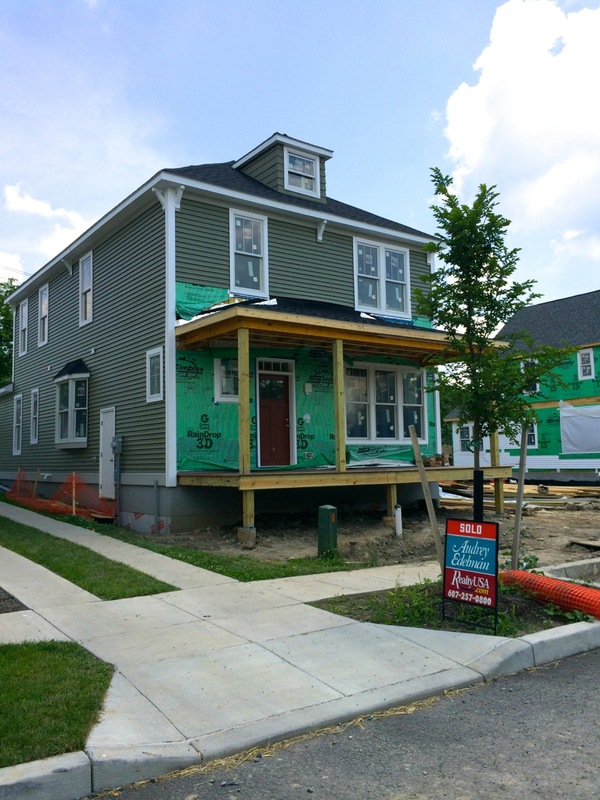 ), along with porch-framing, siding, backfilling the foundation, and landscaping. 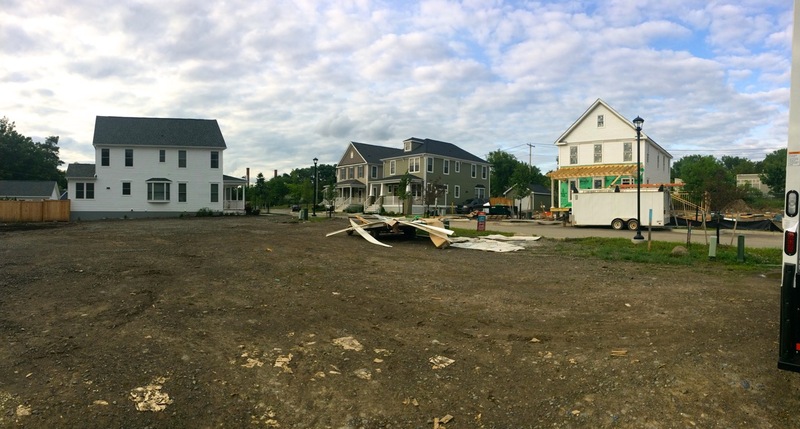 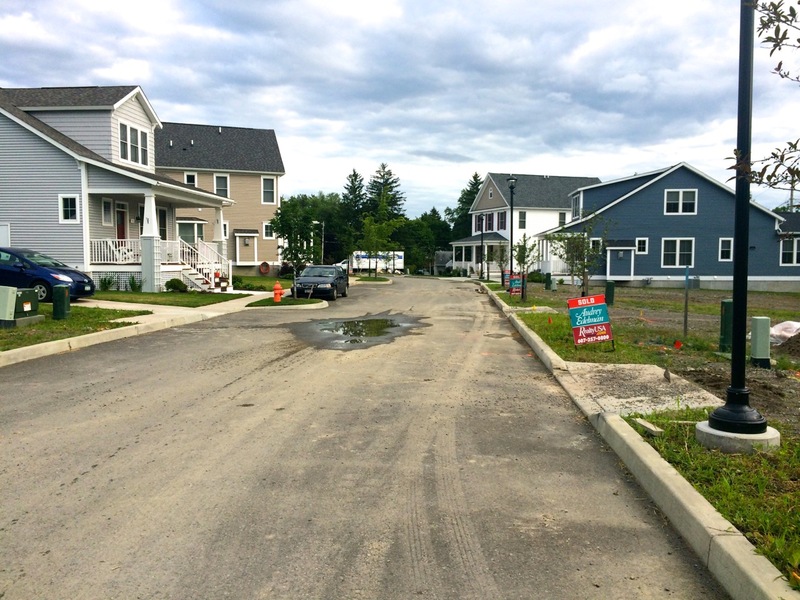 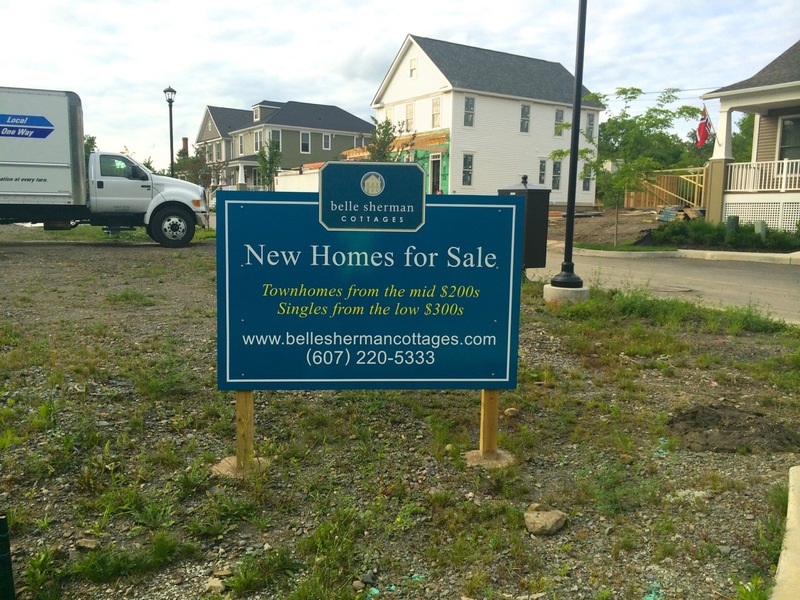 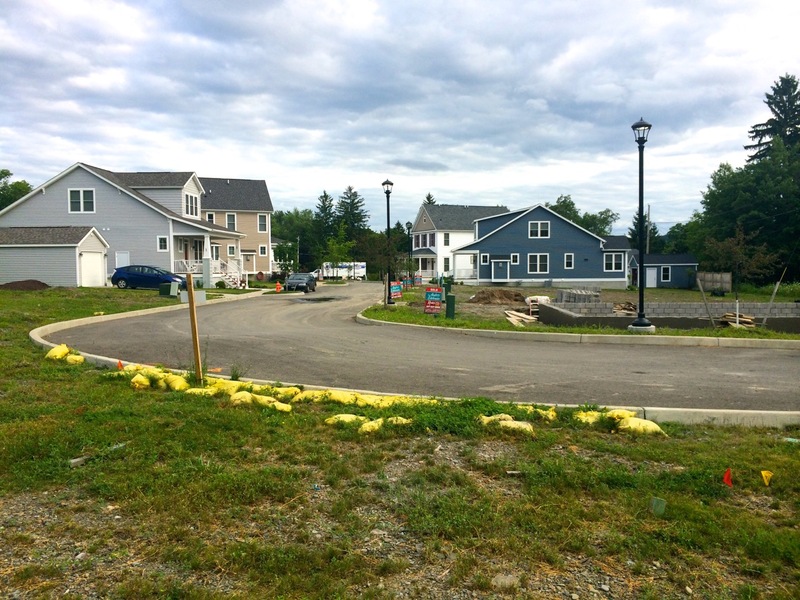 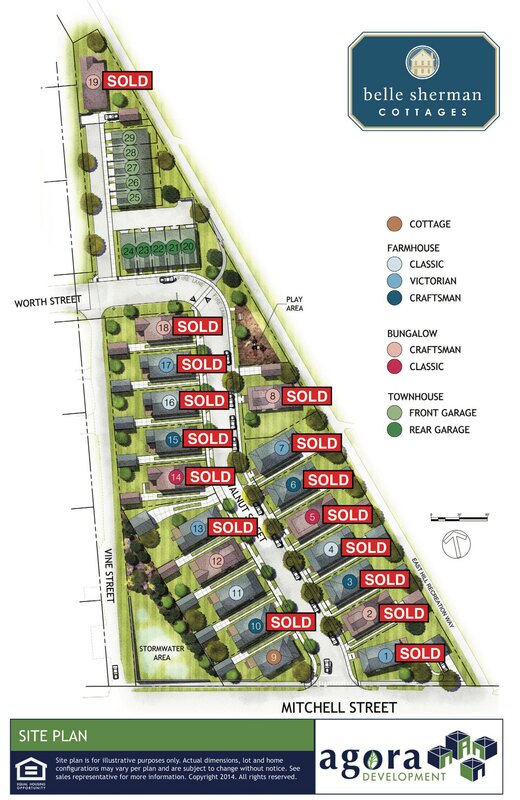 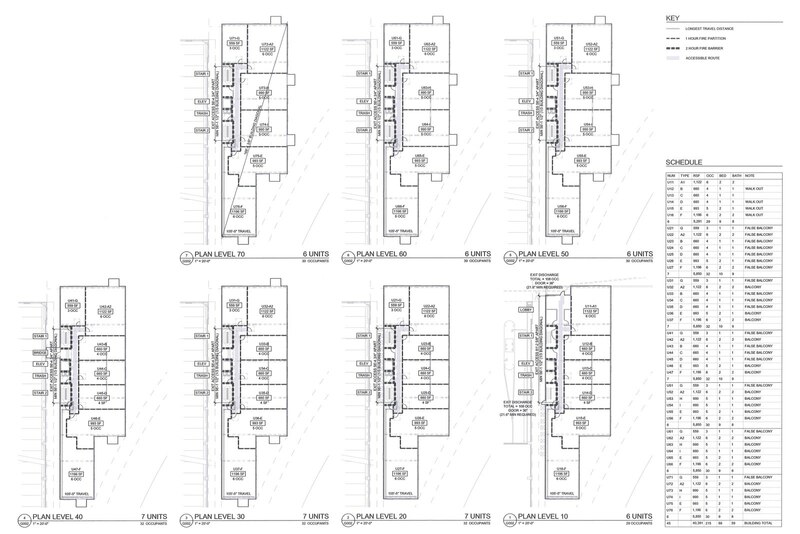 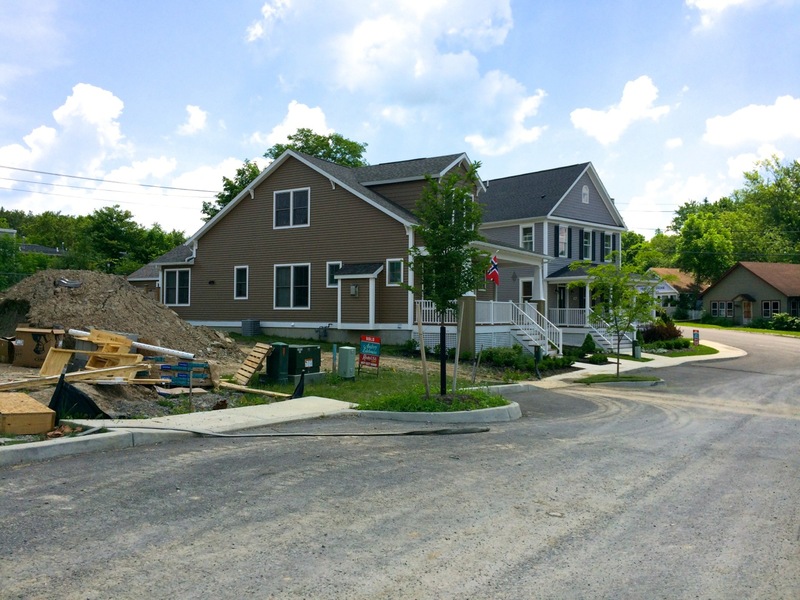 It shouldn’t be long now until the development really fills-in: three homes remain, plus the two rows of townhouses, which will be constructed once enough sales accrue. 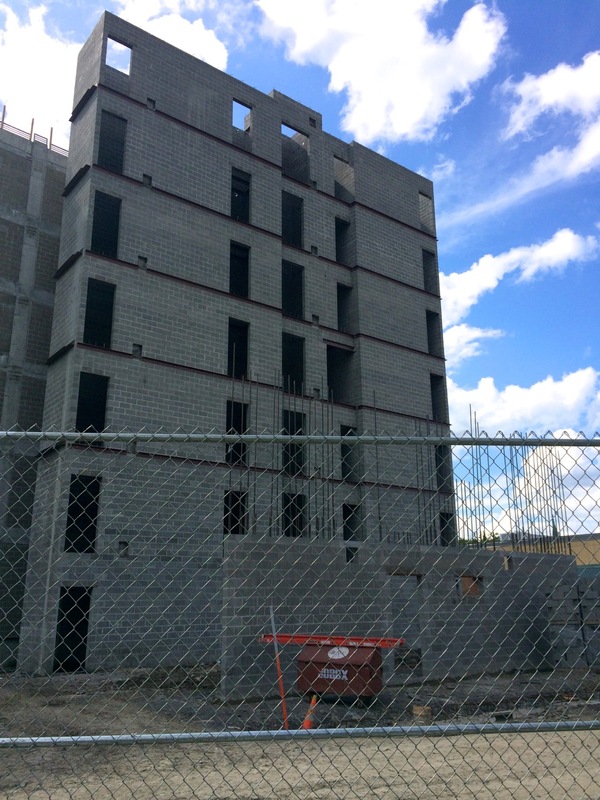 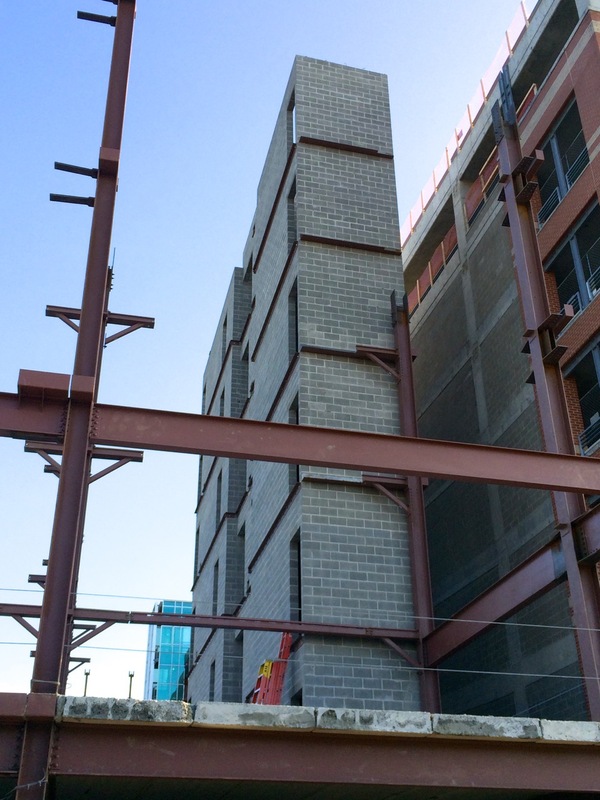 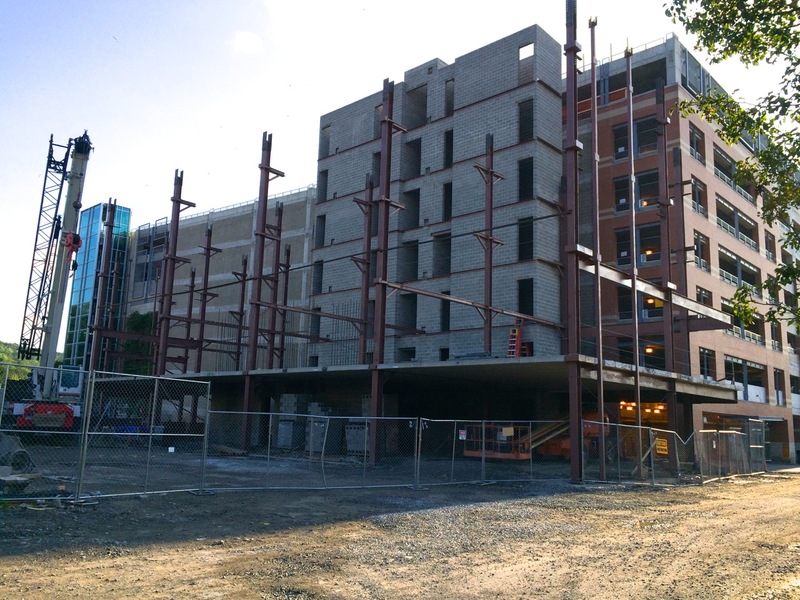 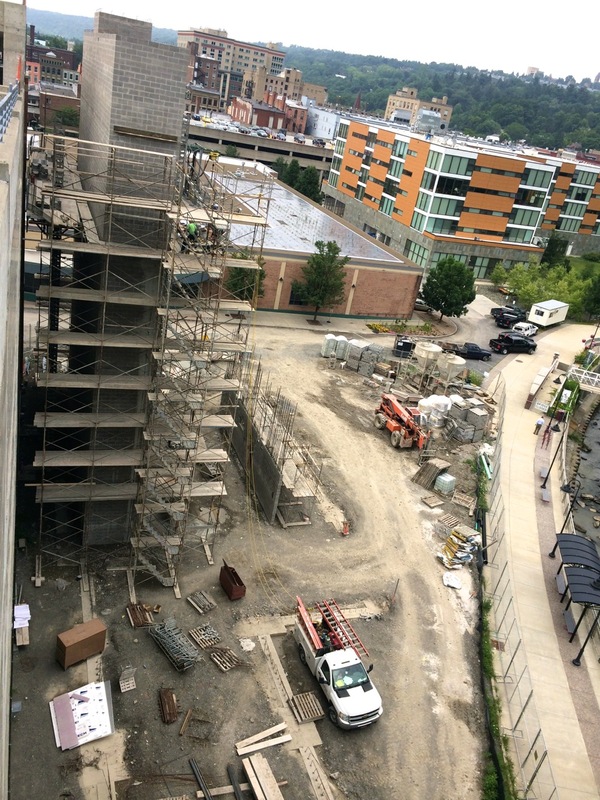 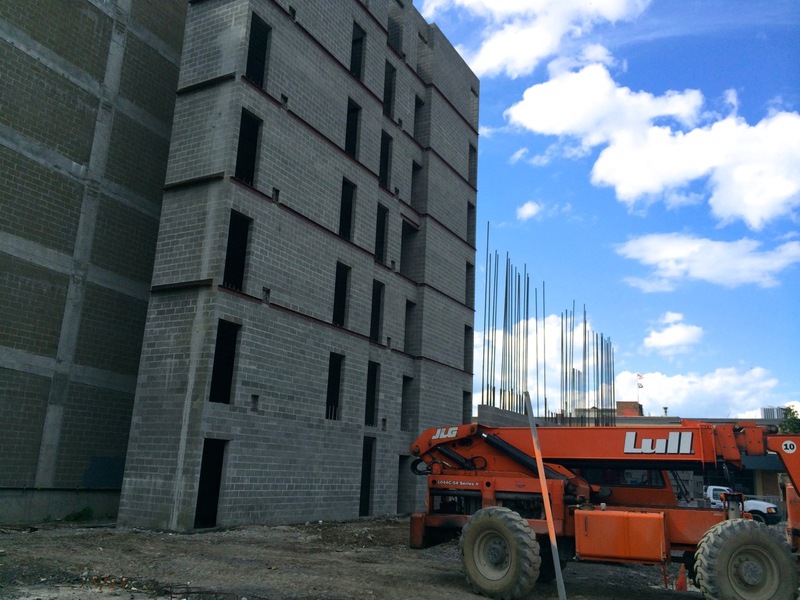 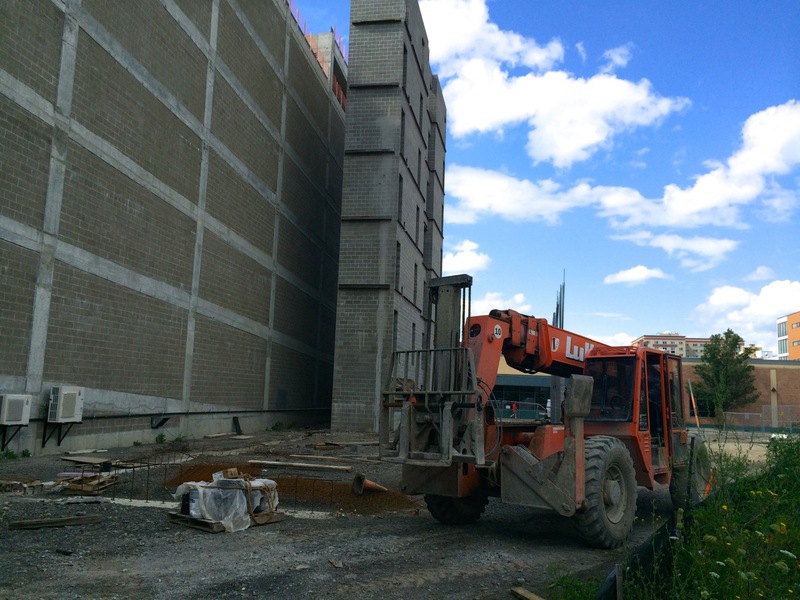 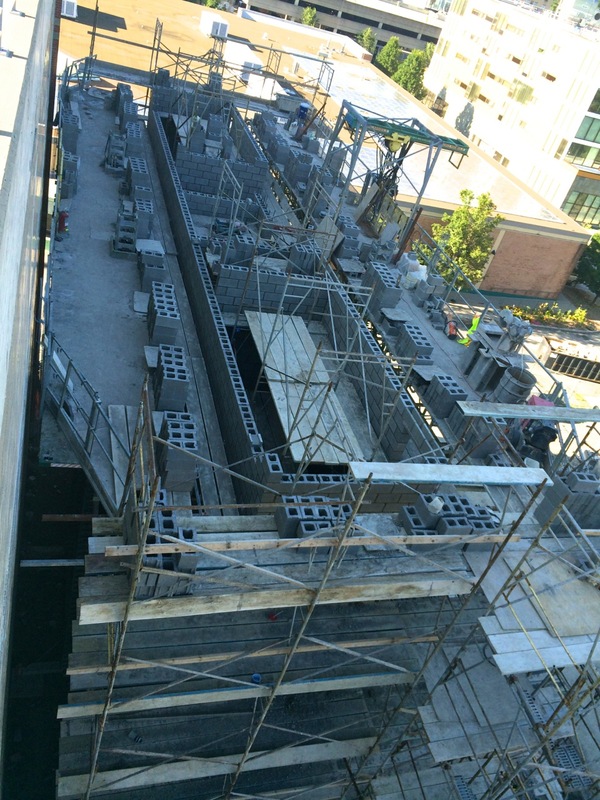 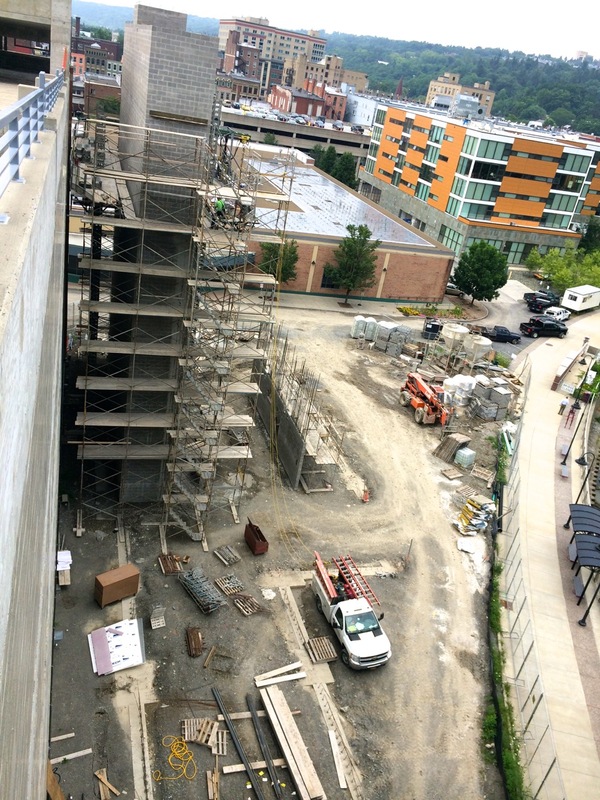 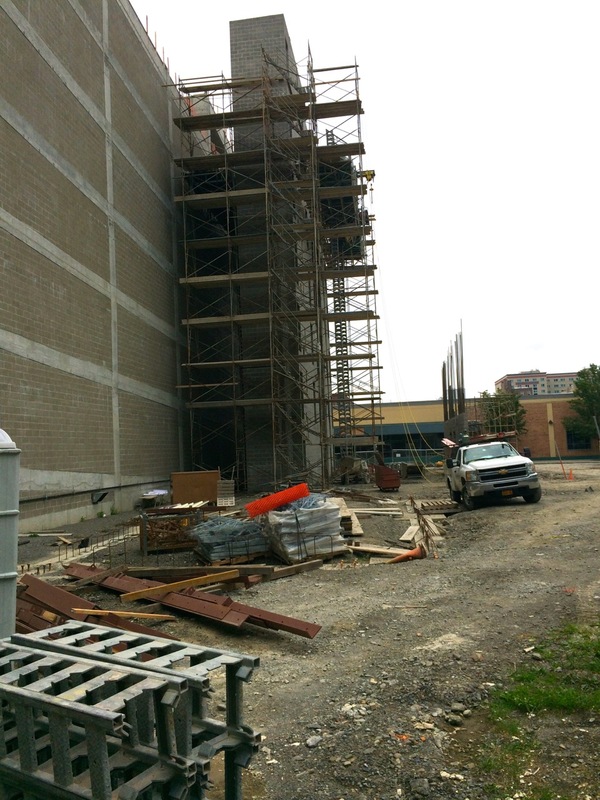 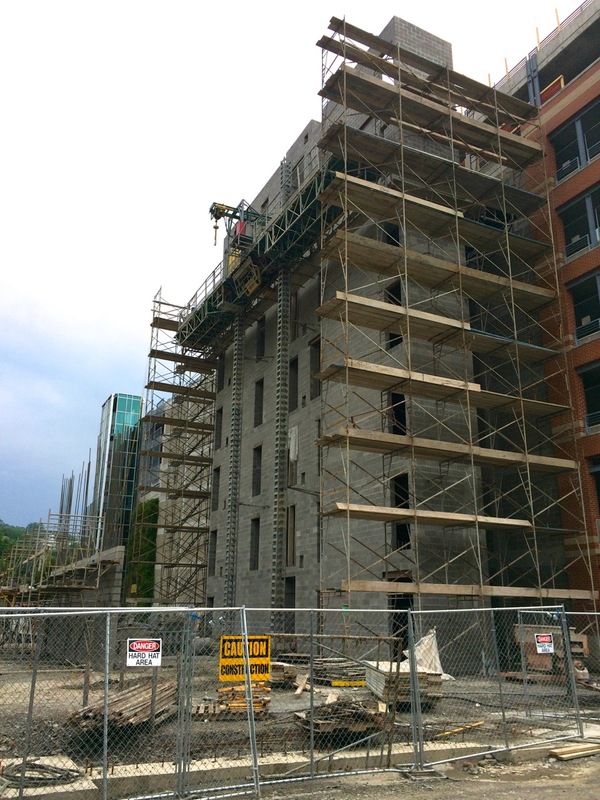 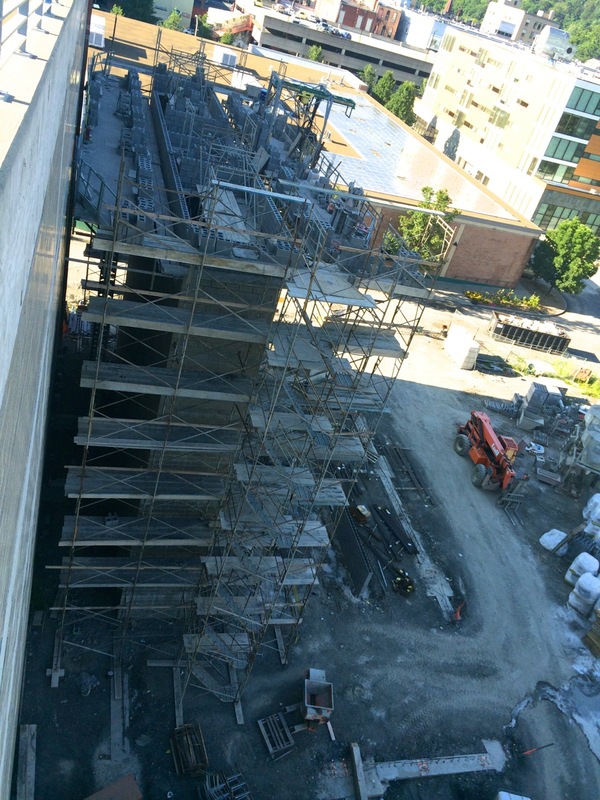 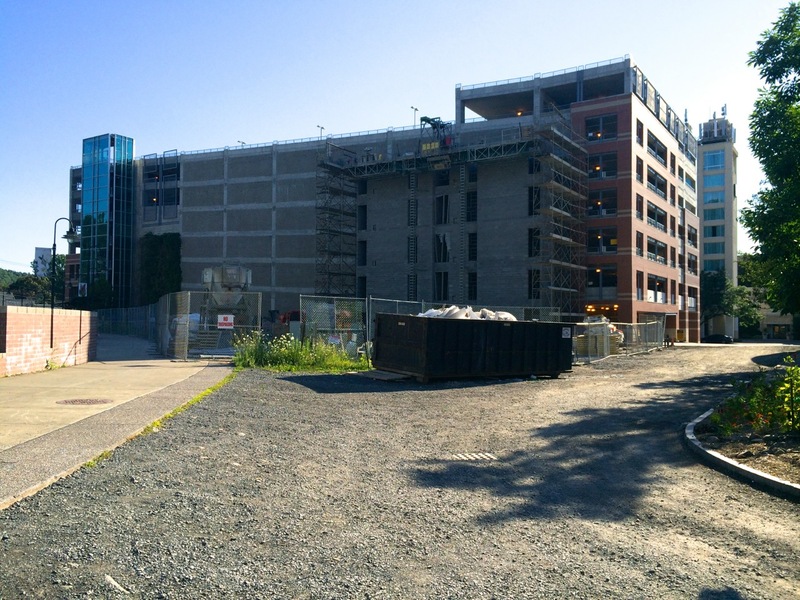 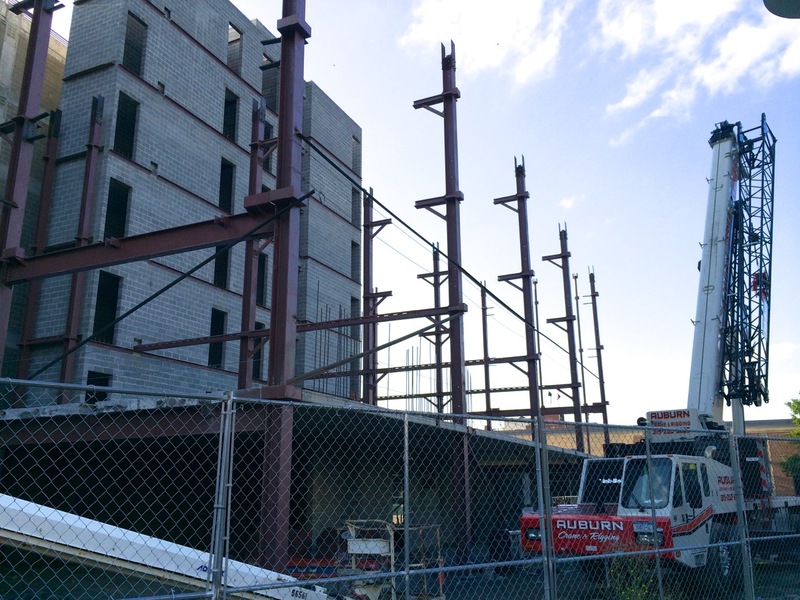 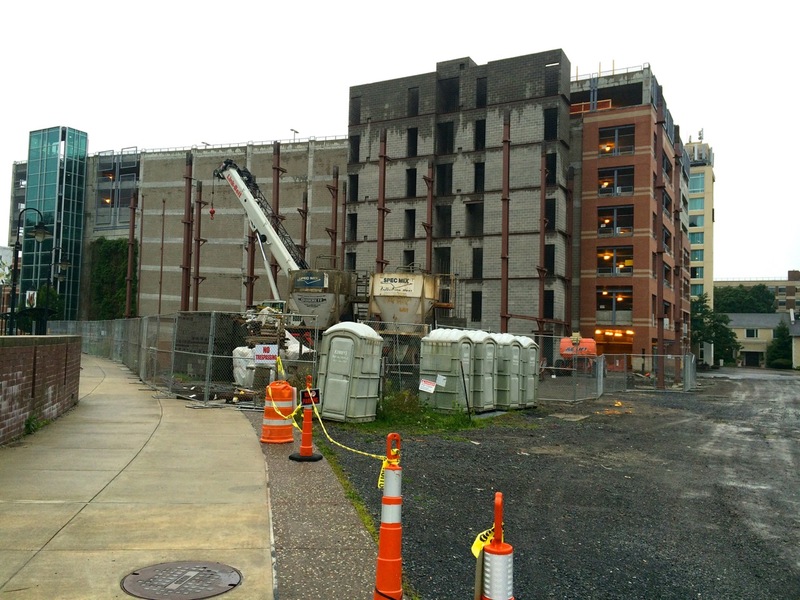 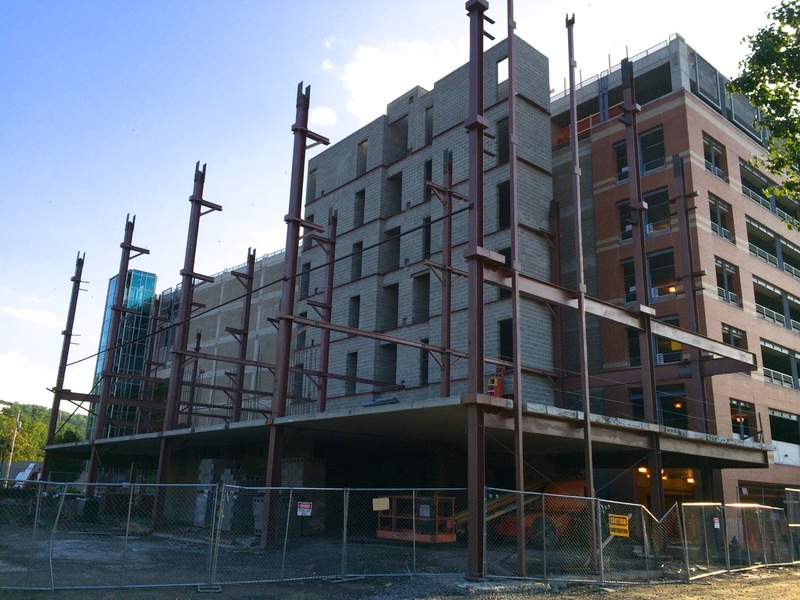 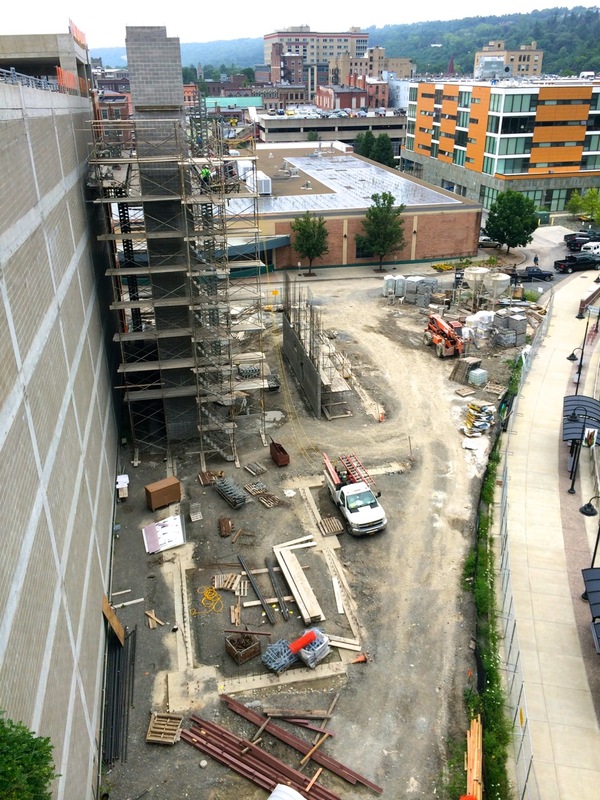 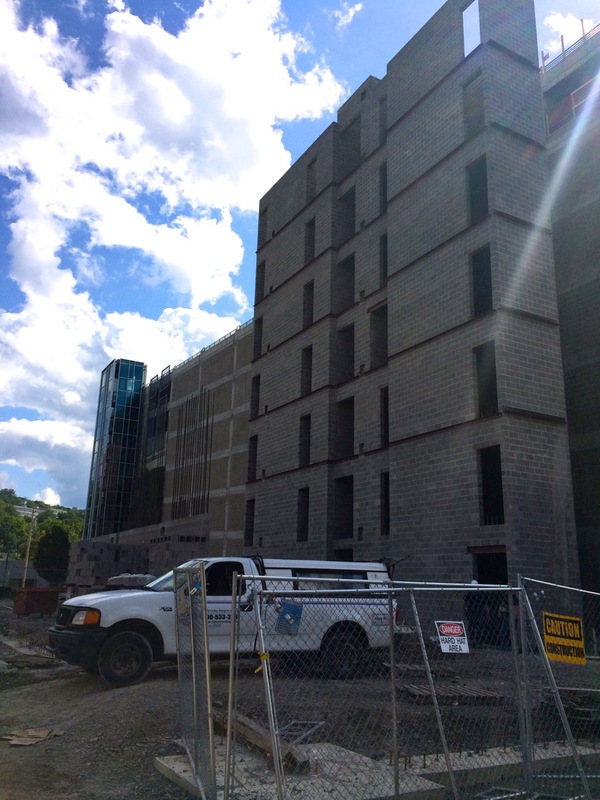 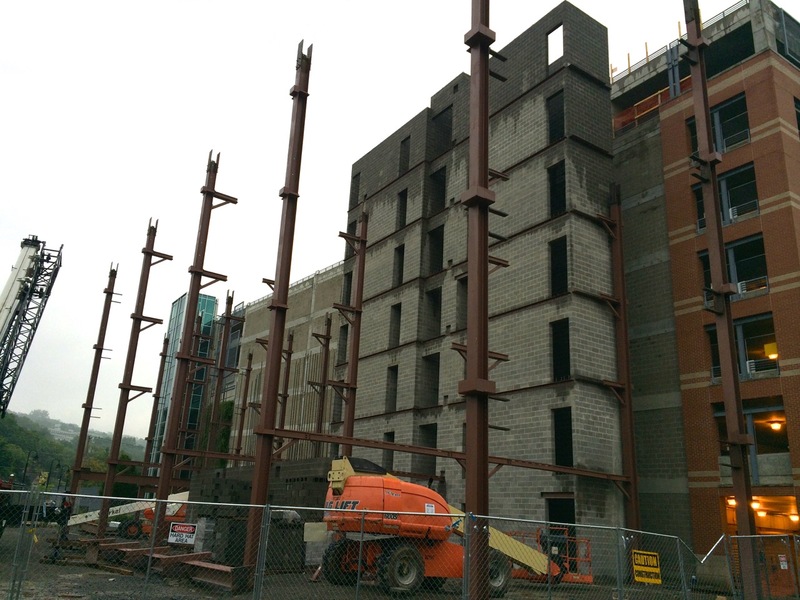 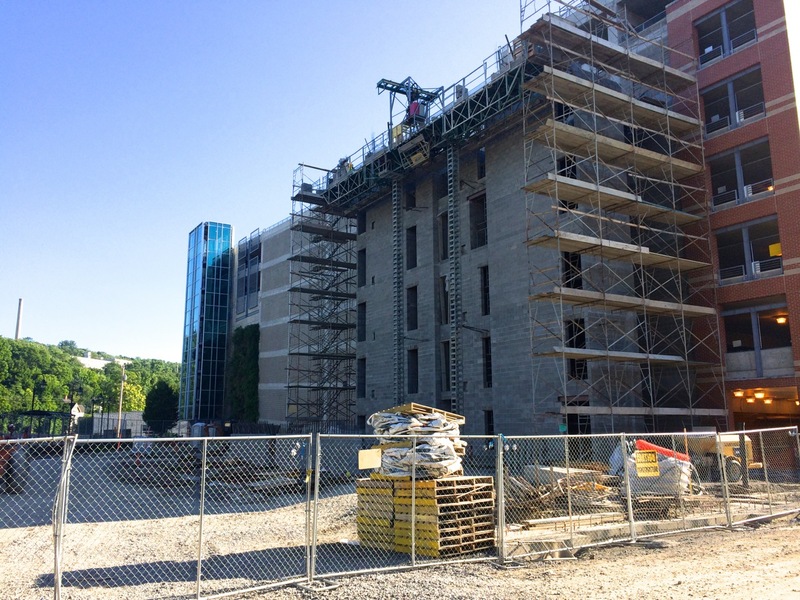 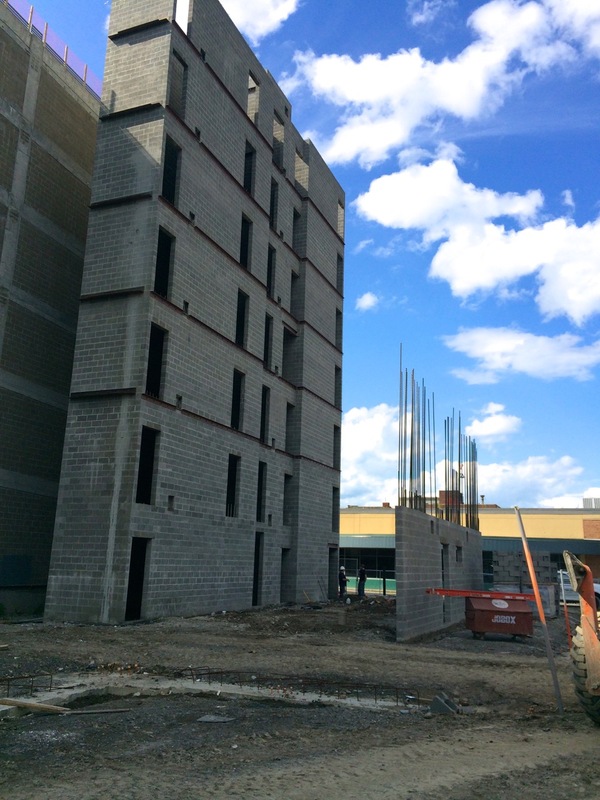 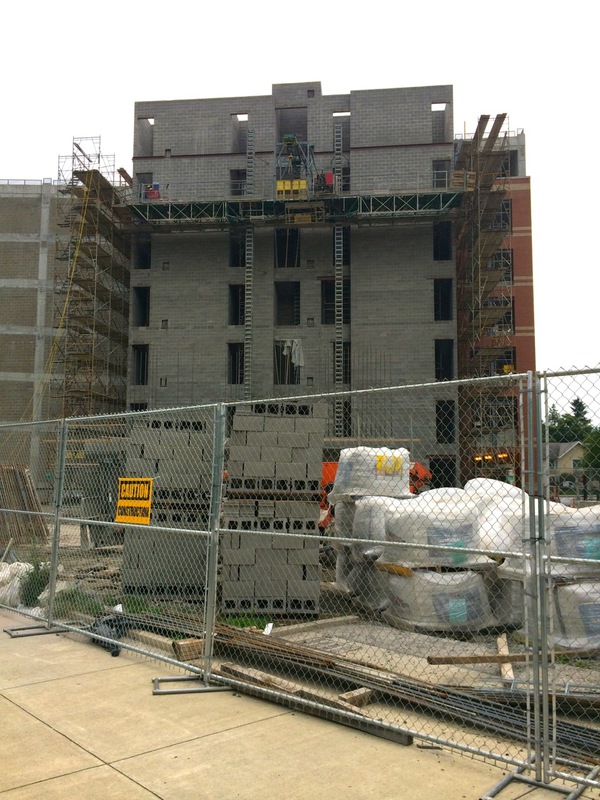 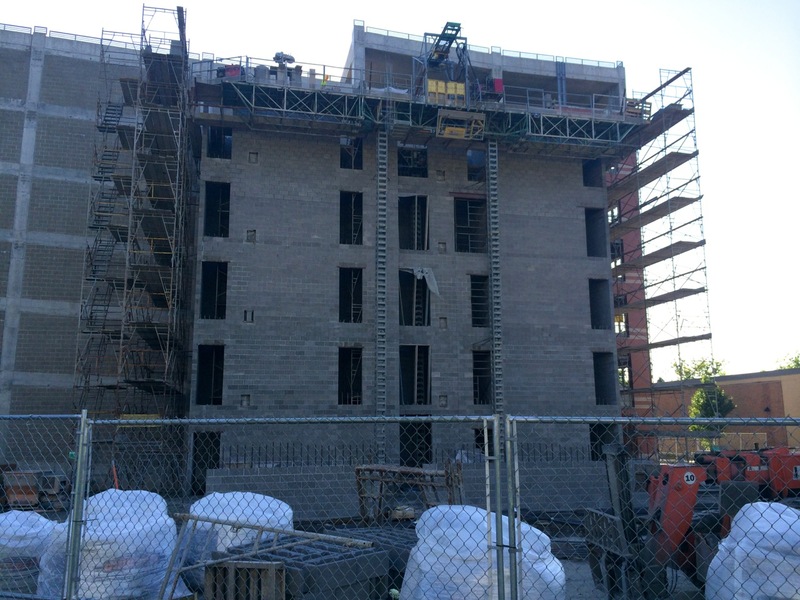 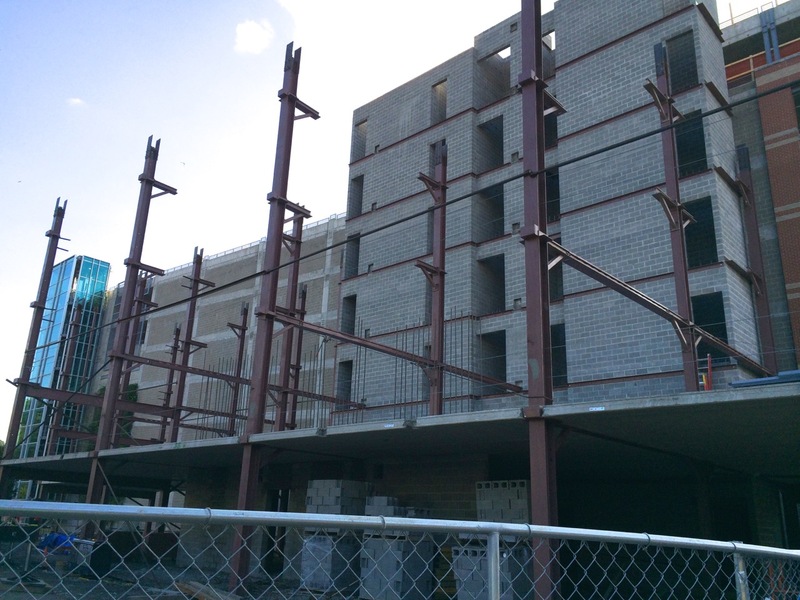 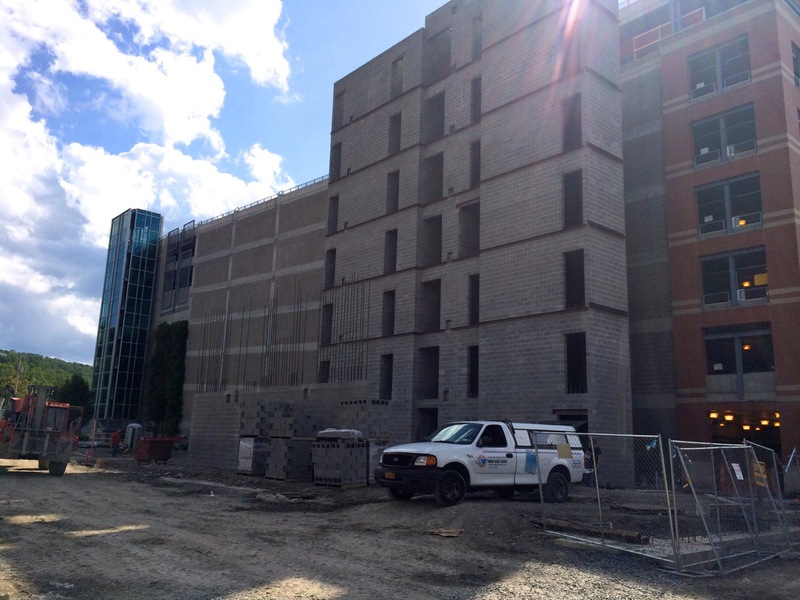 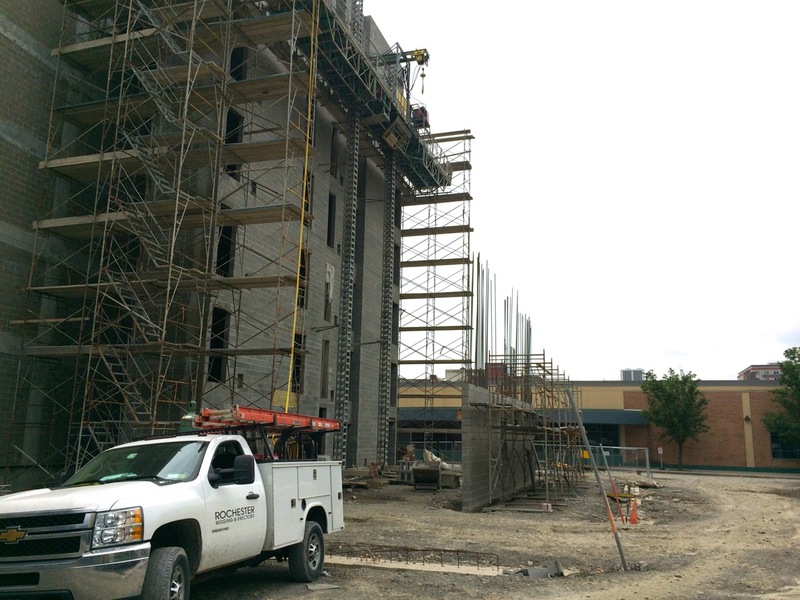 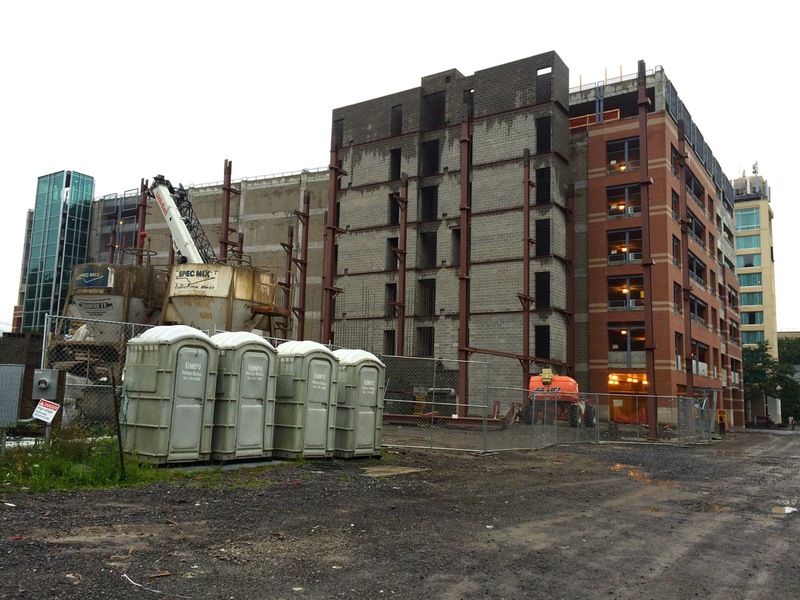 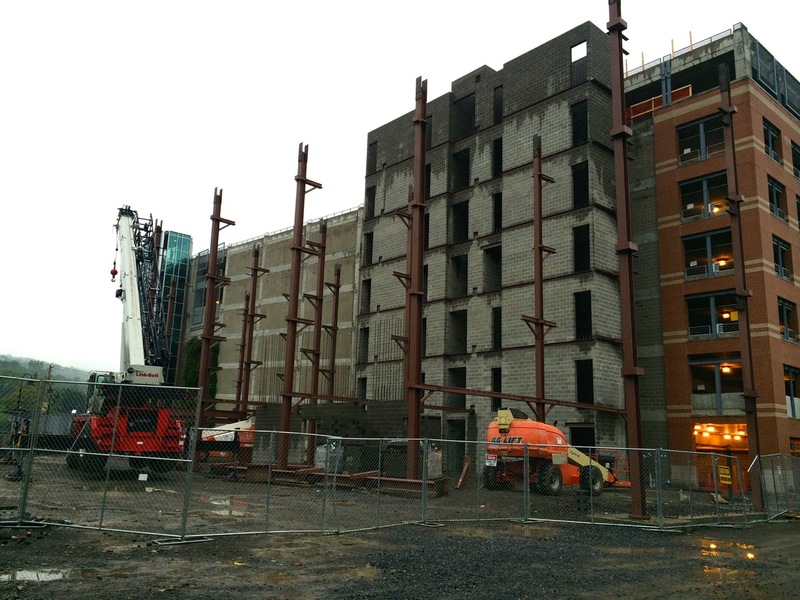 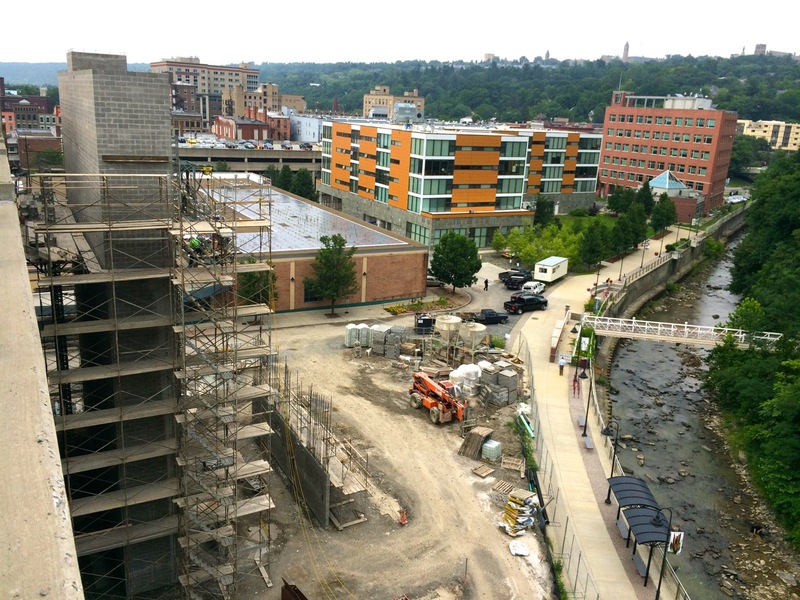 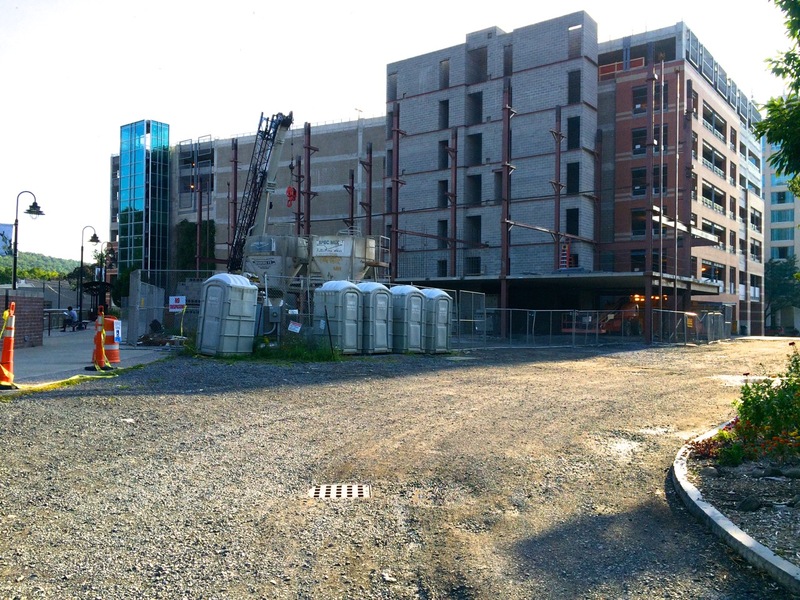 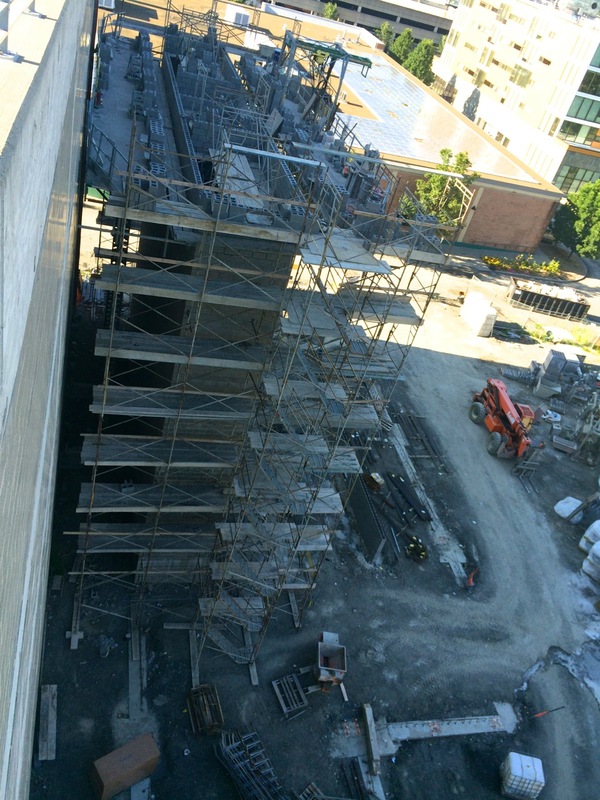 Bloomfield/Schon + Partners‘ 45-unit, 49,244 gross square-foot Cayuga Place Residences Project has been moving full steam ahead with core concrete block work in the last few weeks, and looks on-pace for the final 7th story this week or early next. 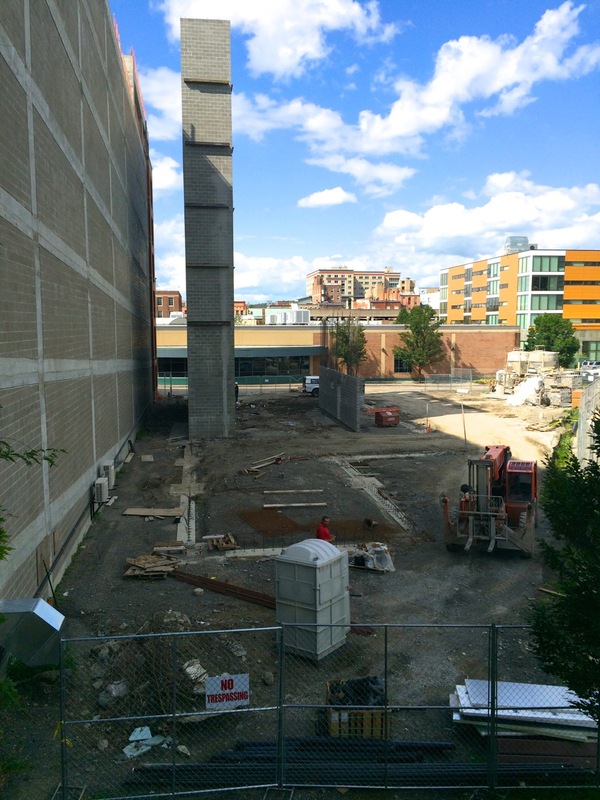 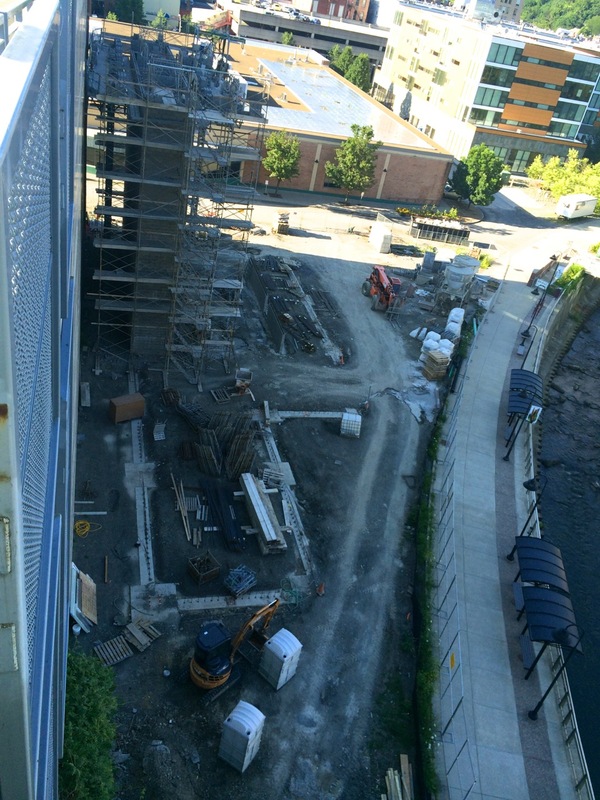 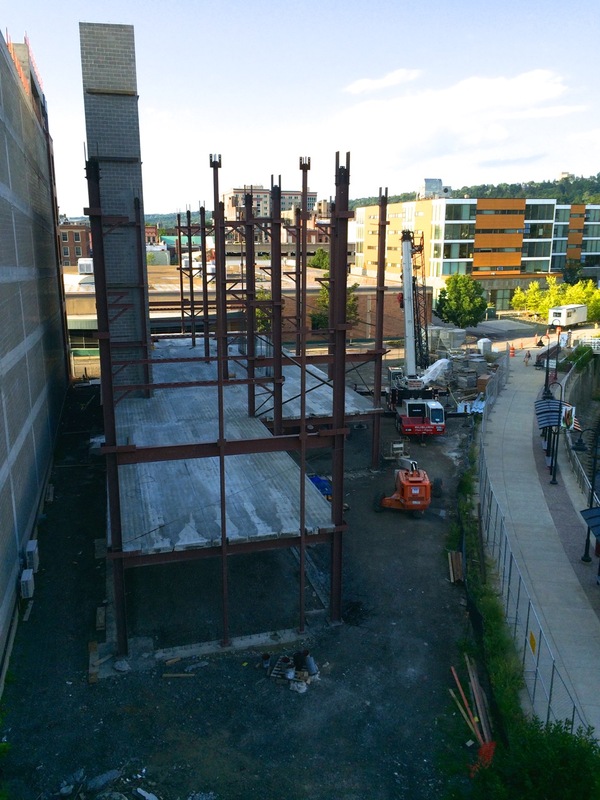 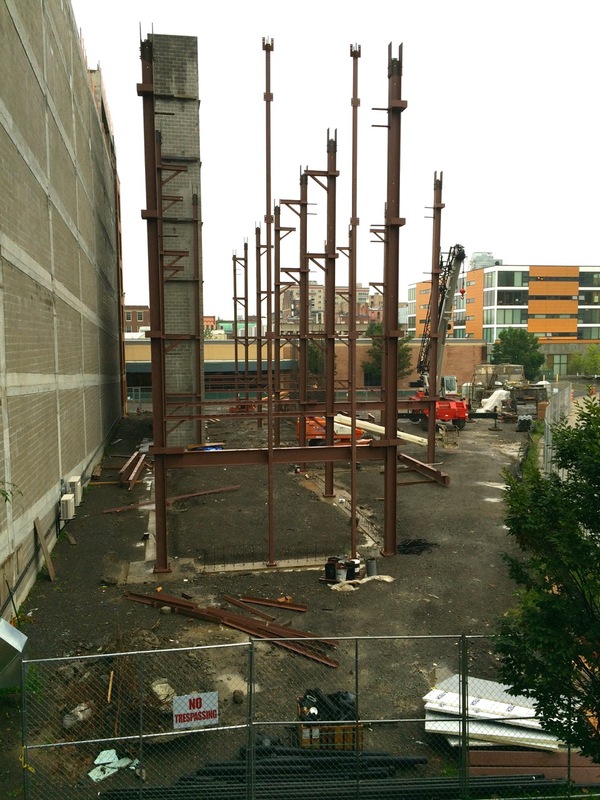 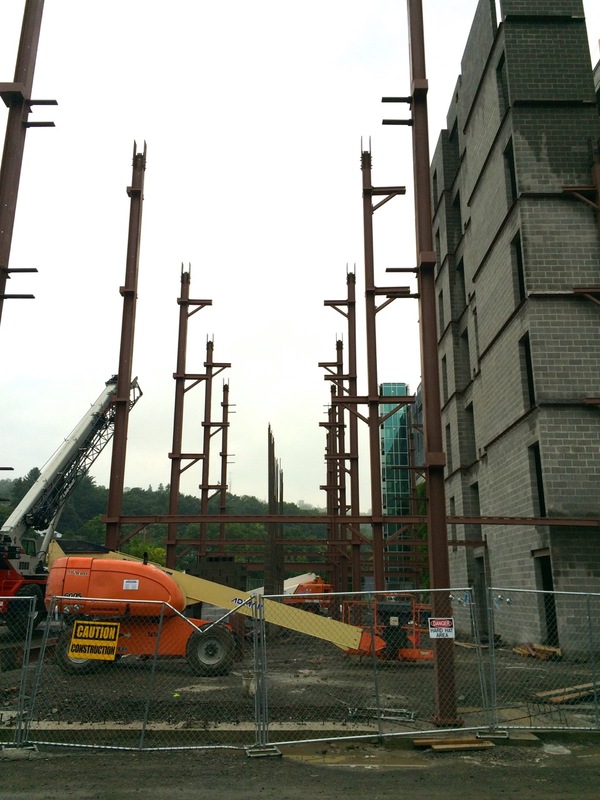 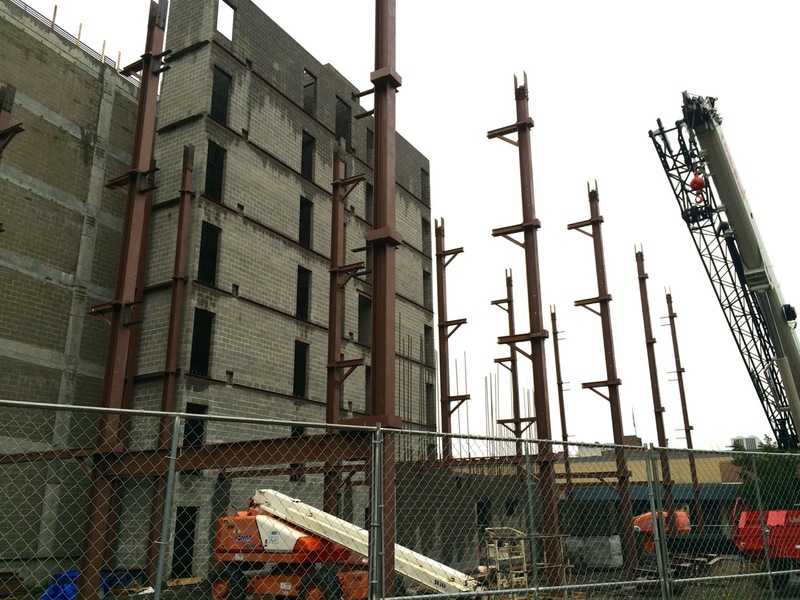 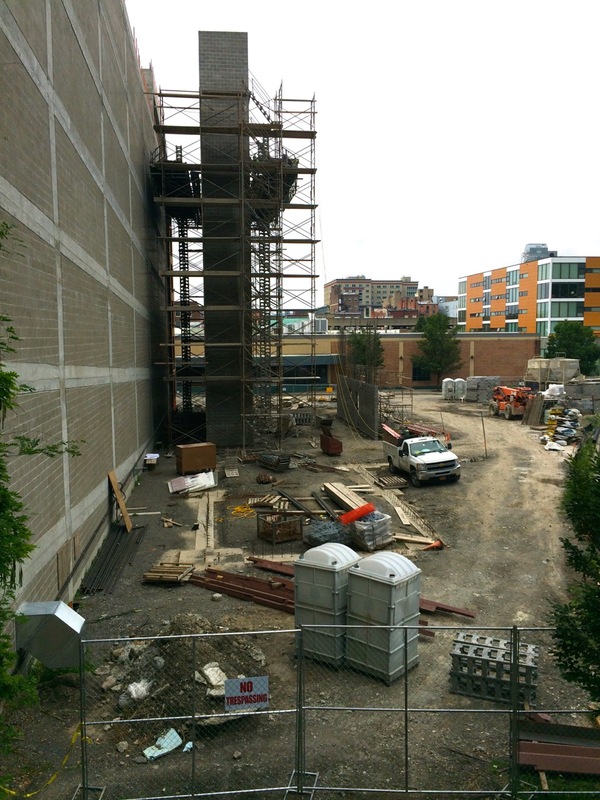 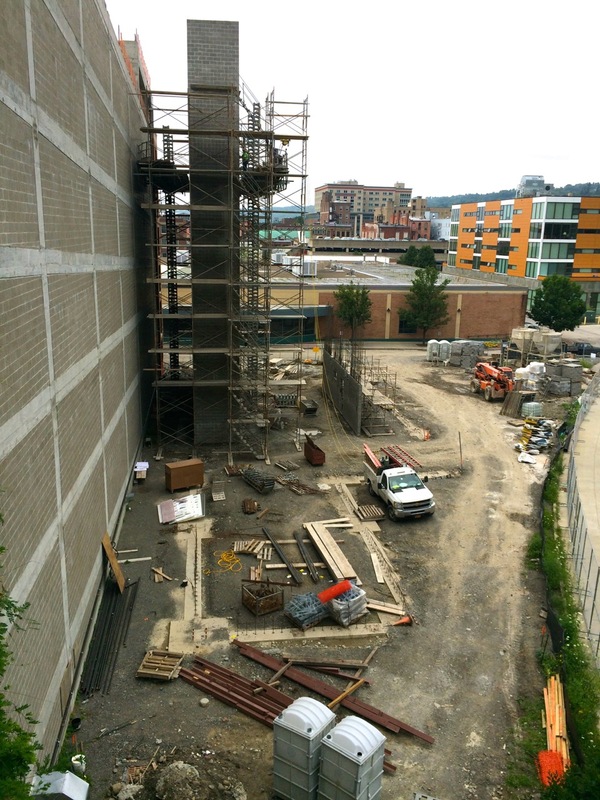 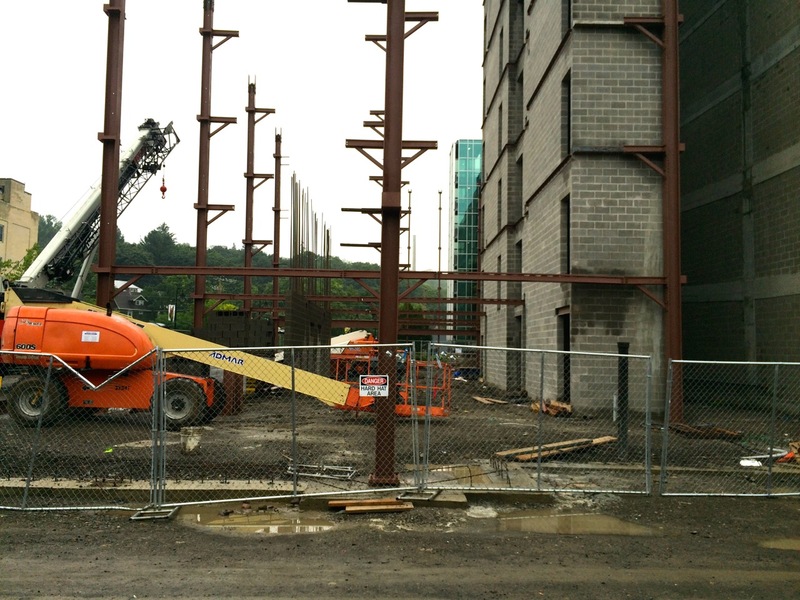 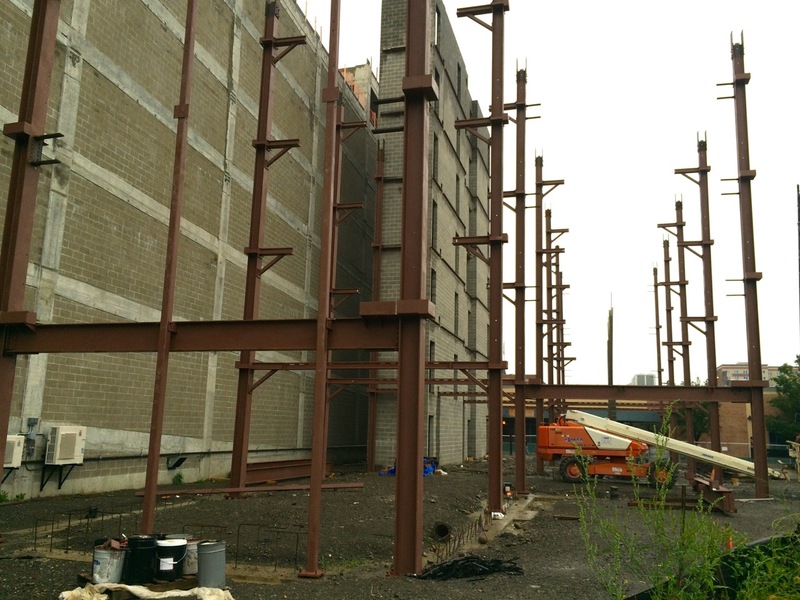 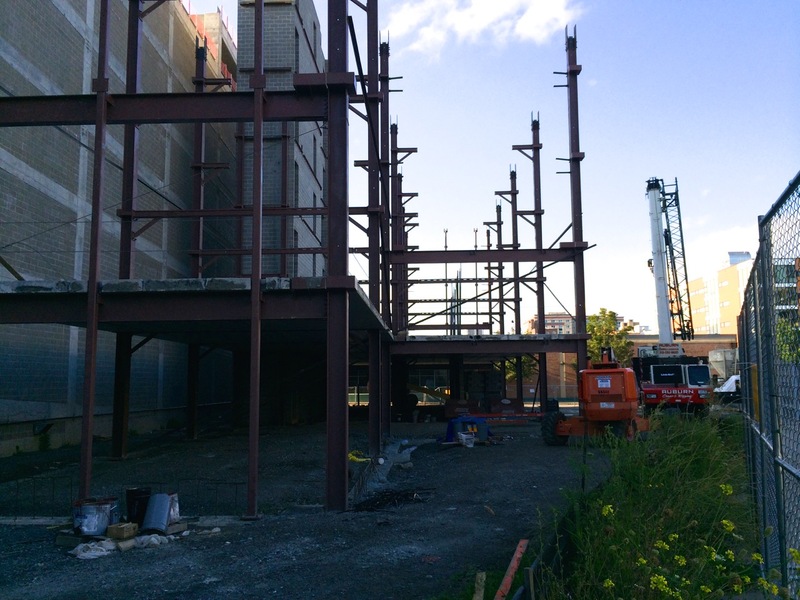 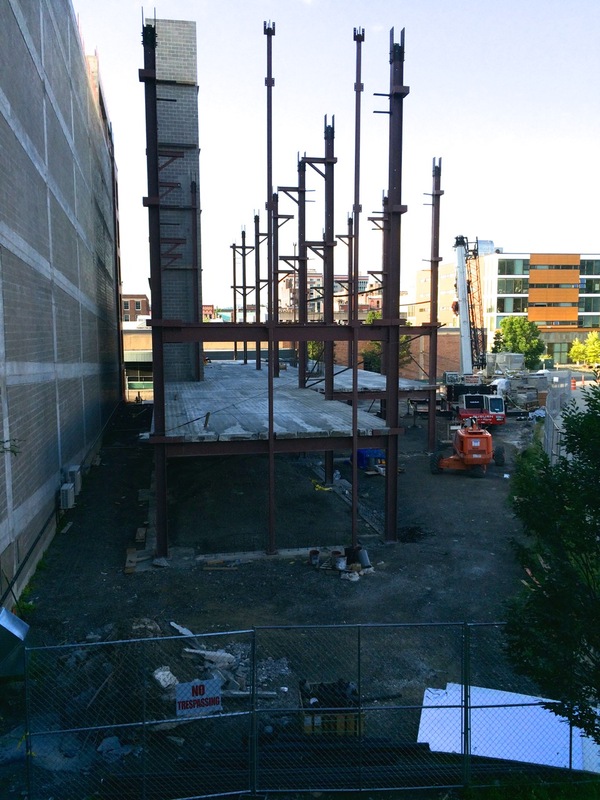 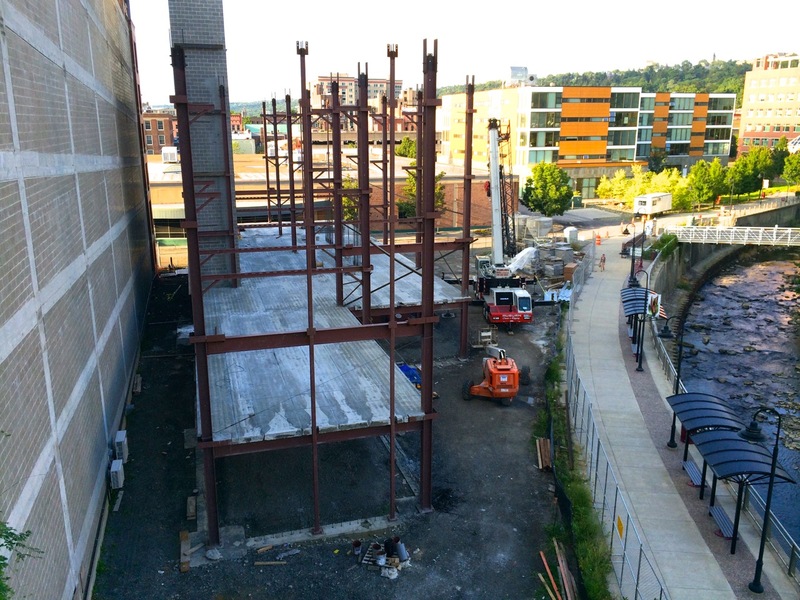 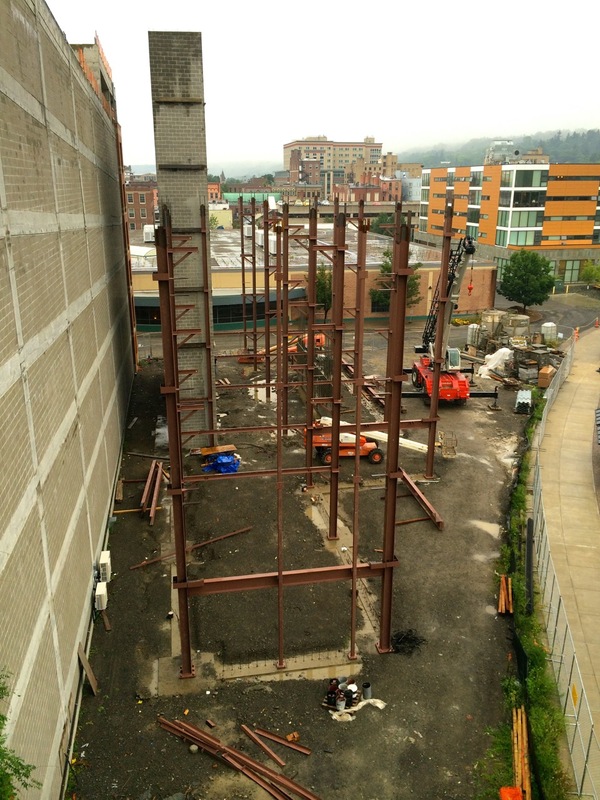 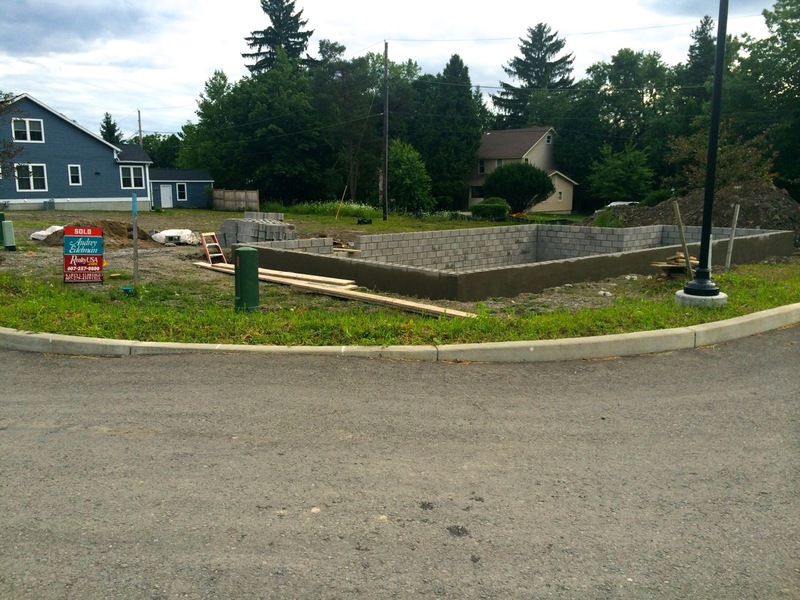 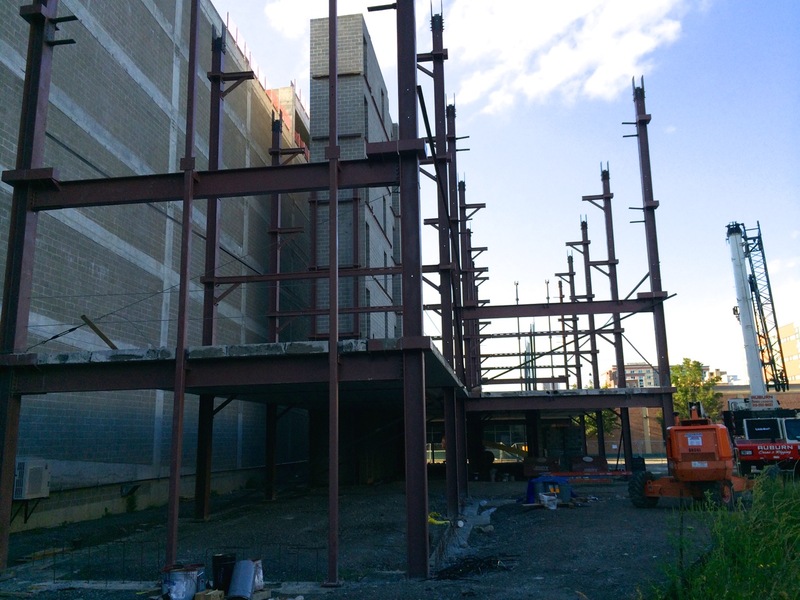 The foundation was finished-up in late June, which included foundation footers supported by steel auger micropiles. 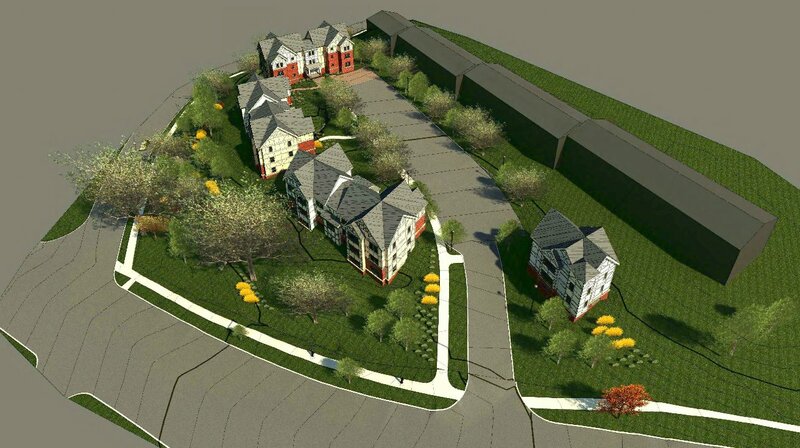 The project will be joining Breckenridge Place (50 apartments) and Seneca Way (office space plus 38 apartments) as recently completed downtown projects. 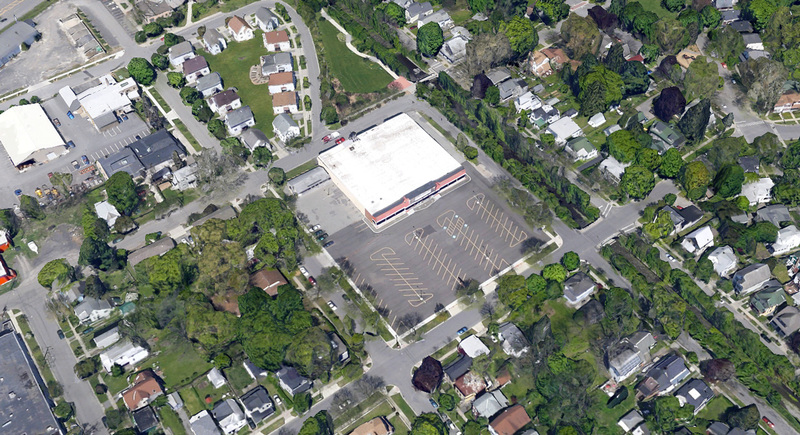 This story popped-up in the news last week, and it’s worth noting due to its size and location. 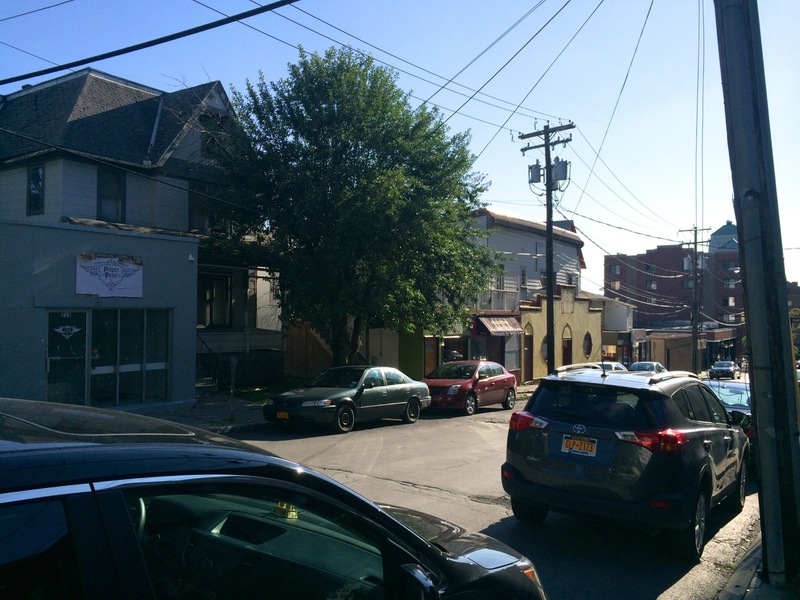 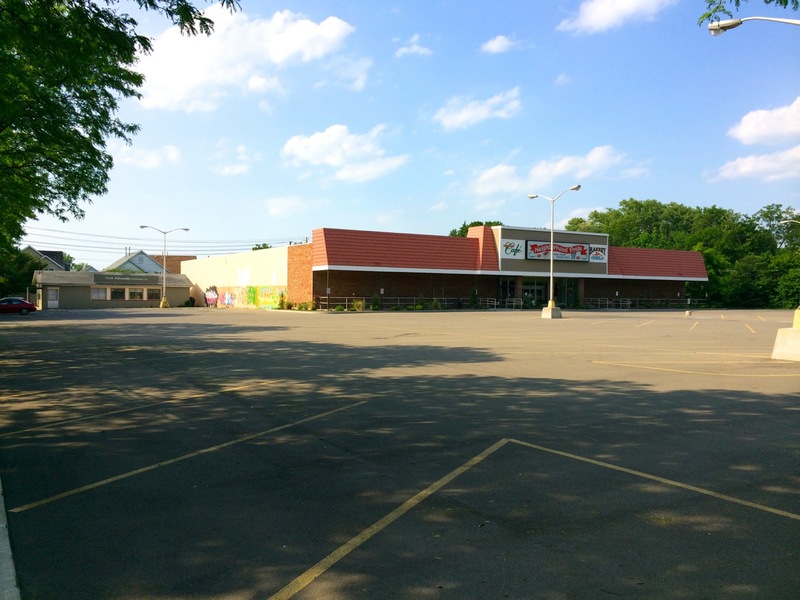 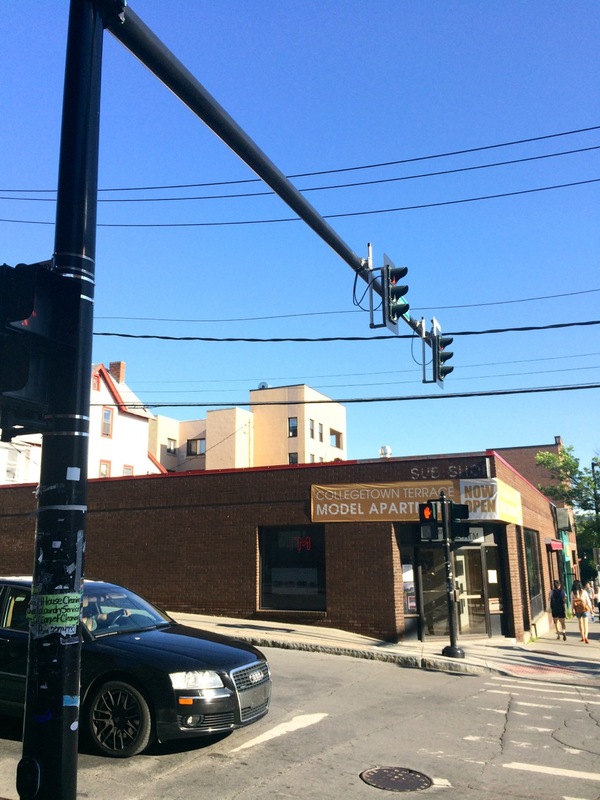 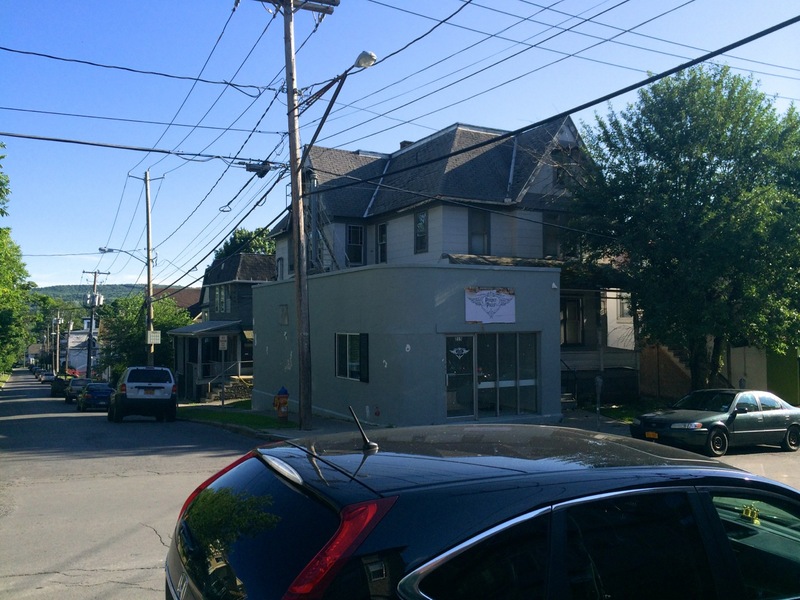 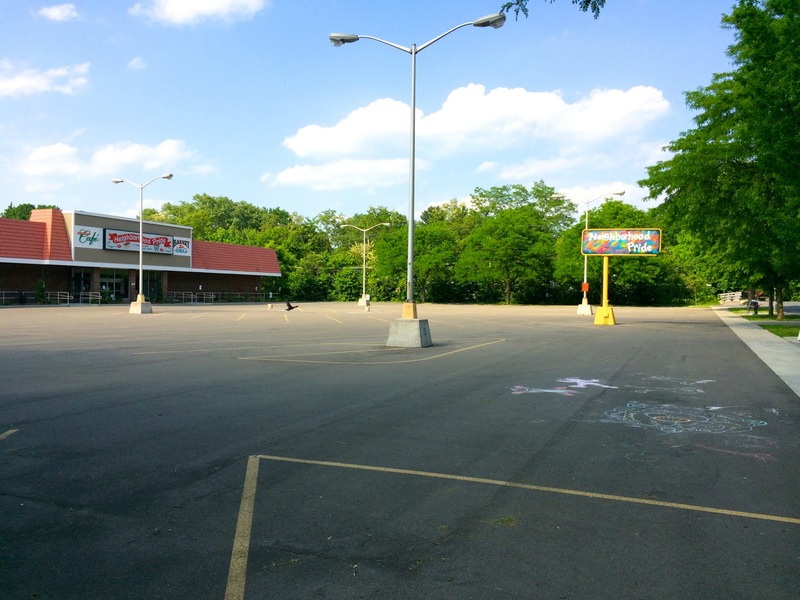 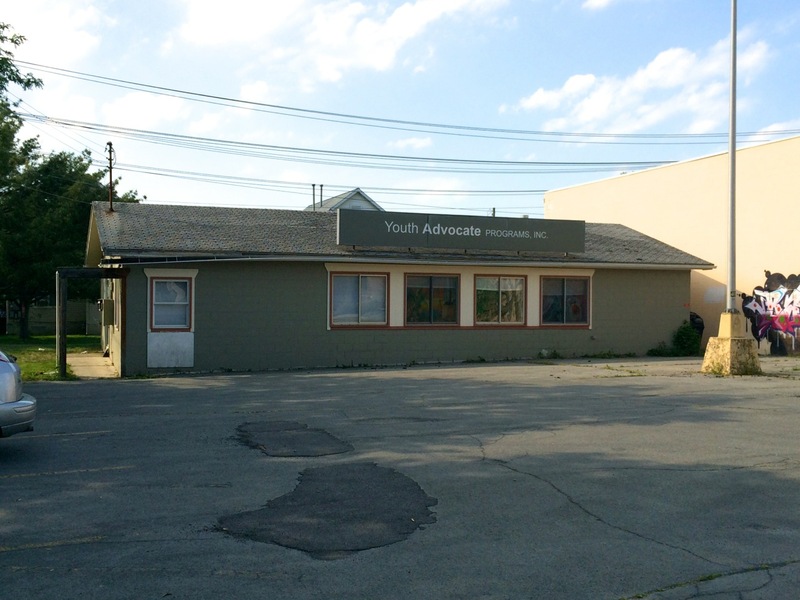 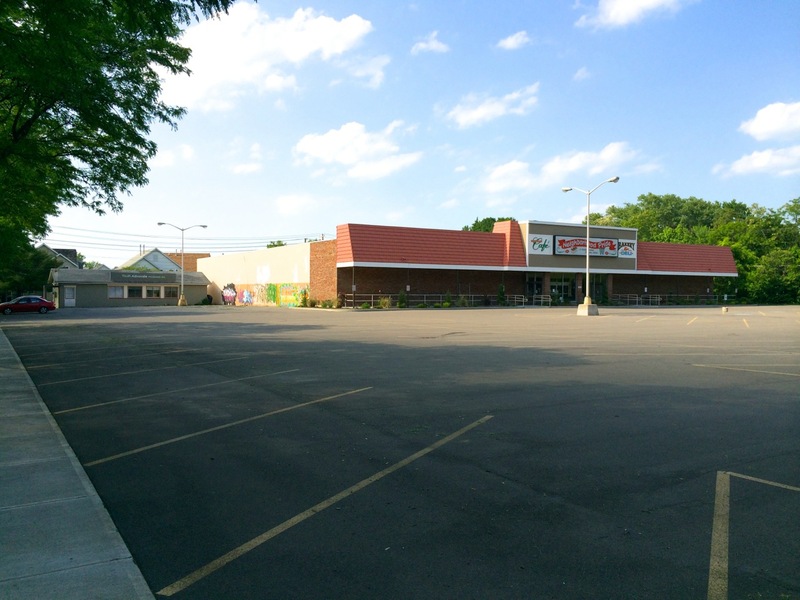 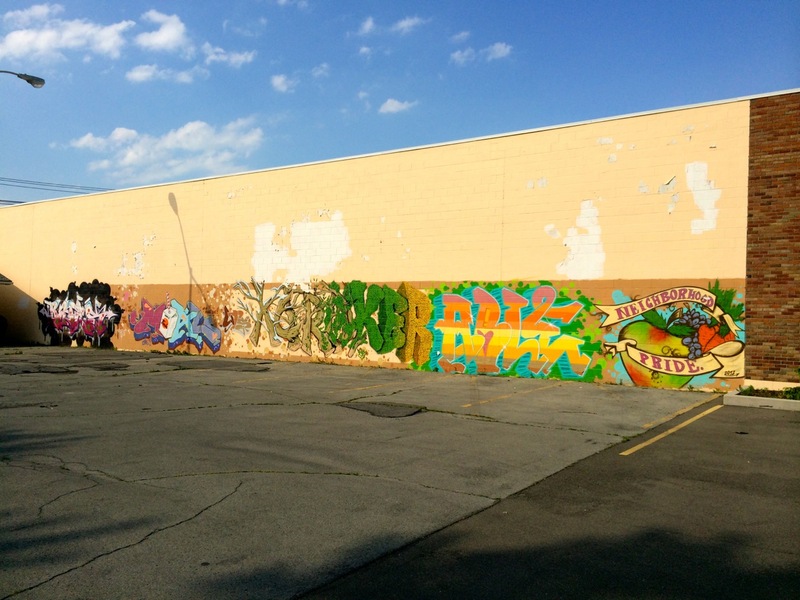 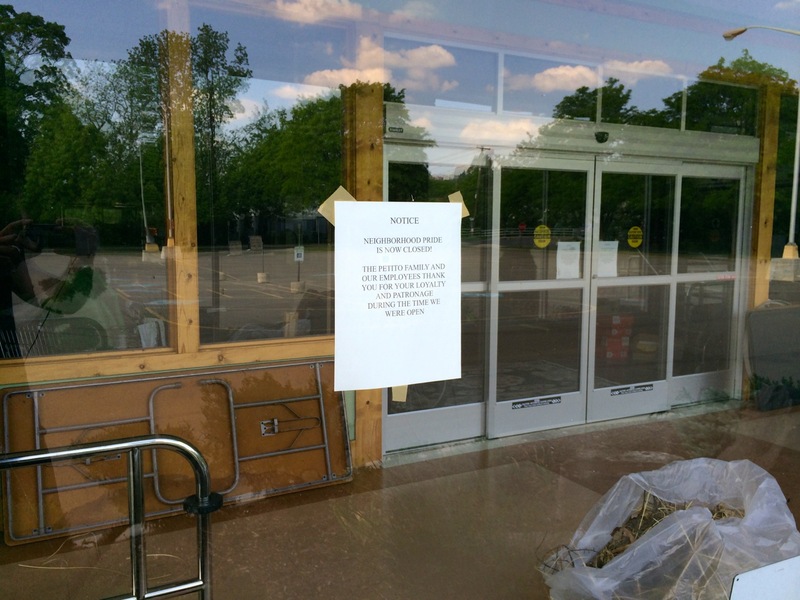 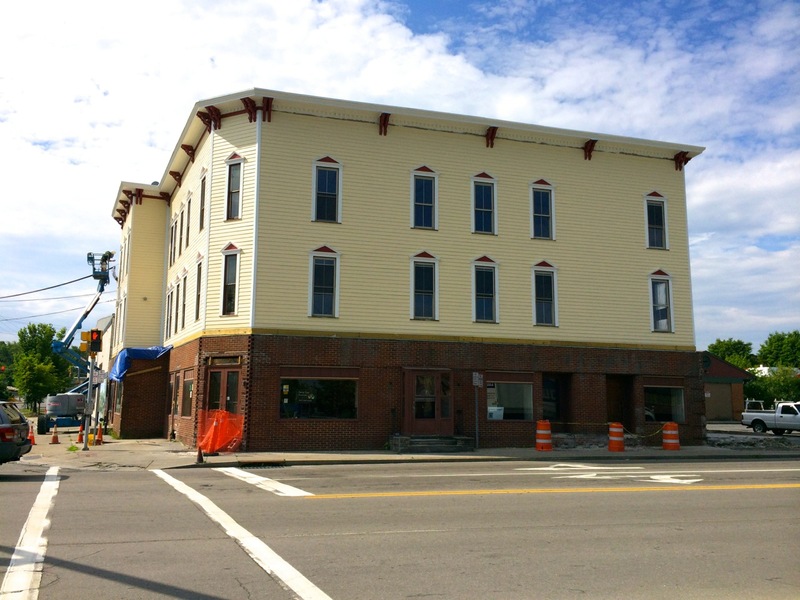 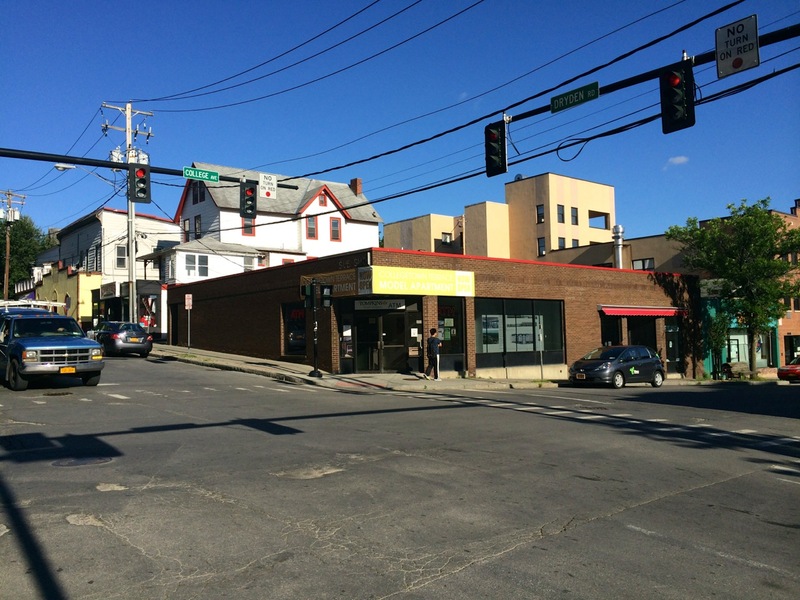 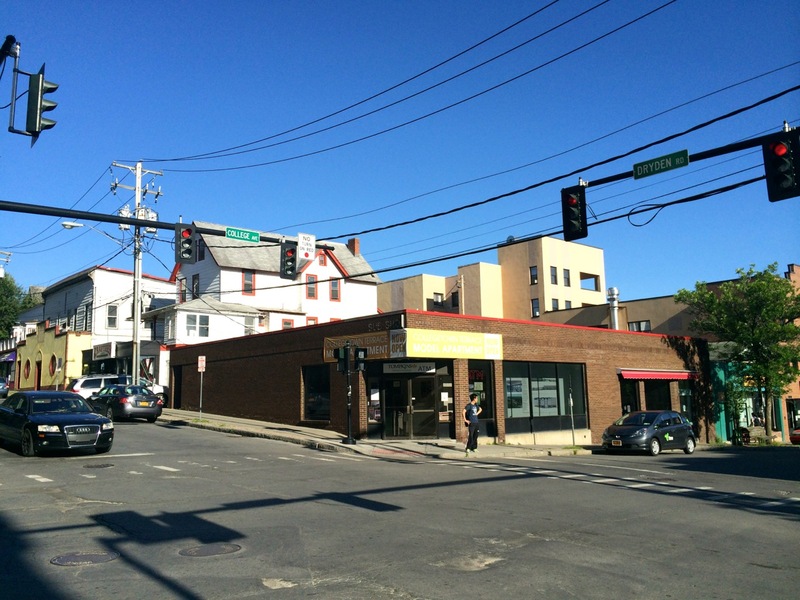 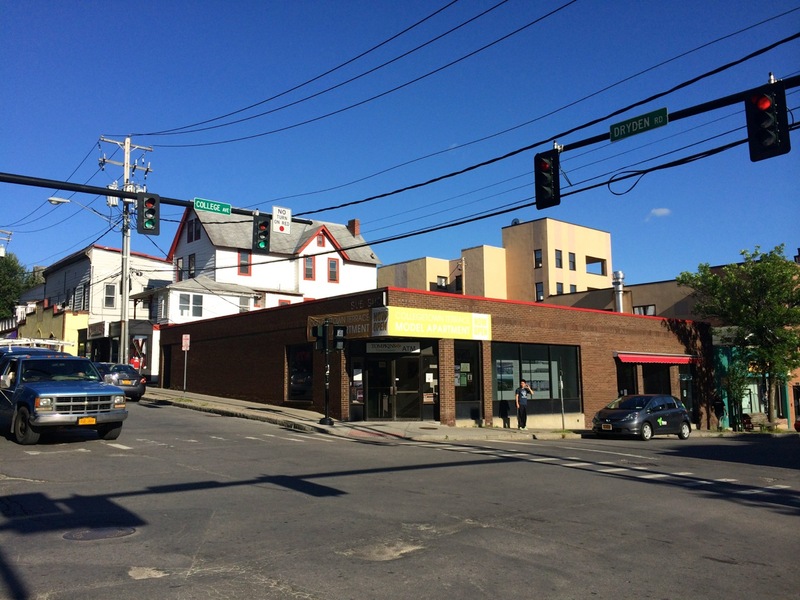 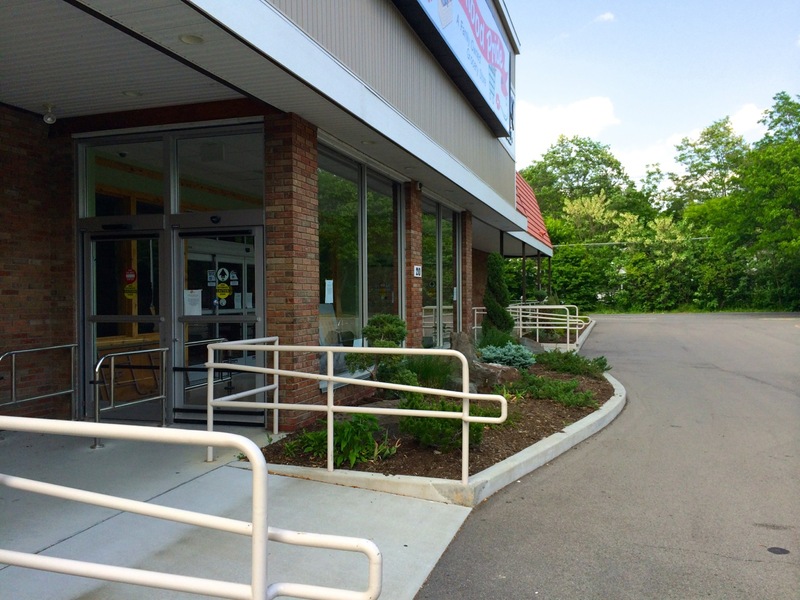 The former Neighborhood Pride grocery store and the next door parcel containing Youth Advocates Inc. of Tompkins County will be sold to Ithaca Neighborhood Housing Services (INHS) for $1.7 million. 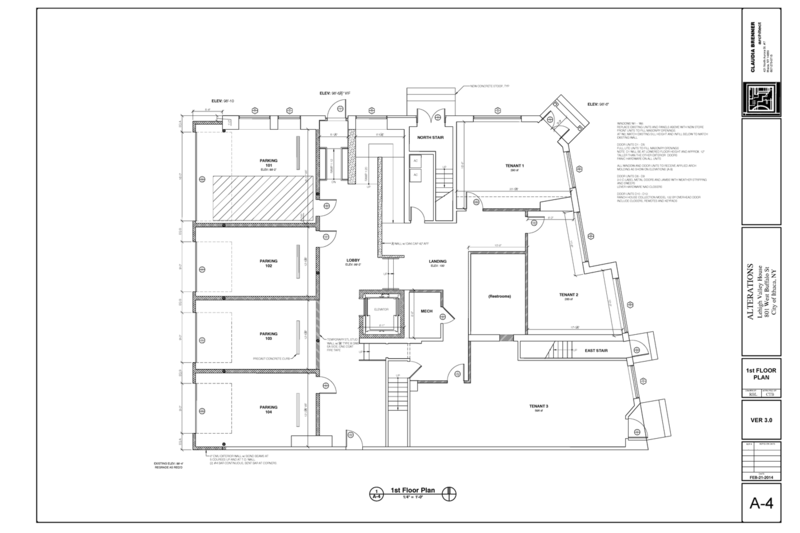 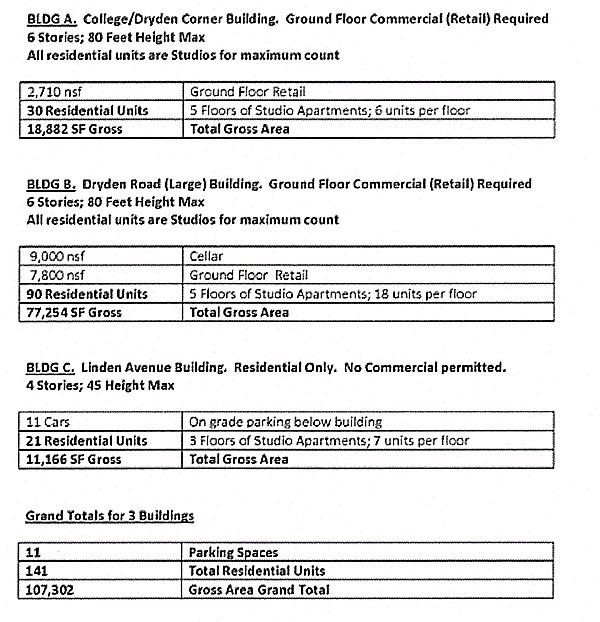 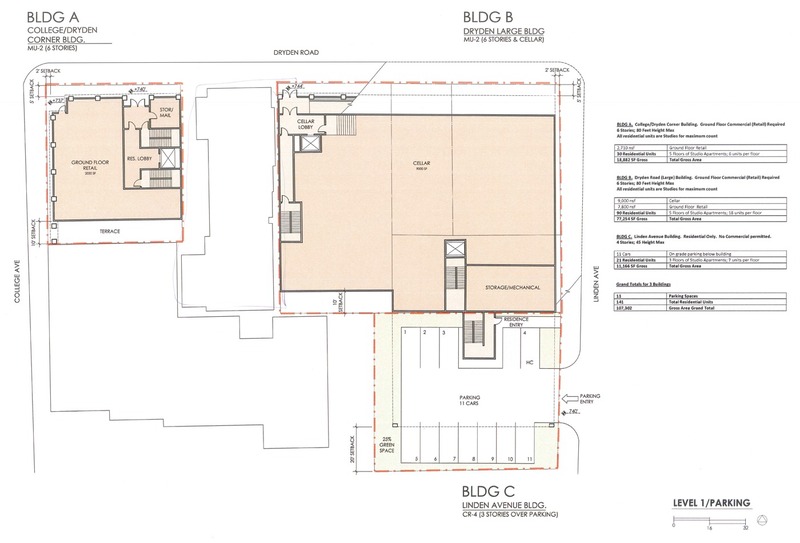 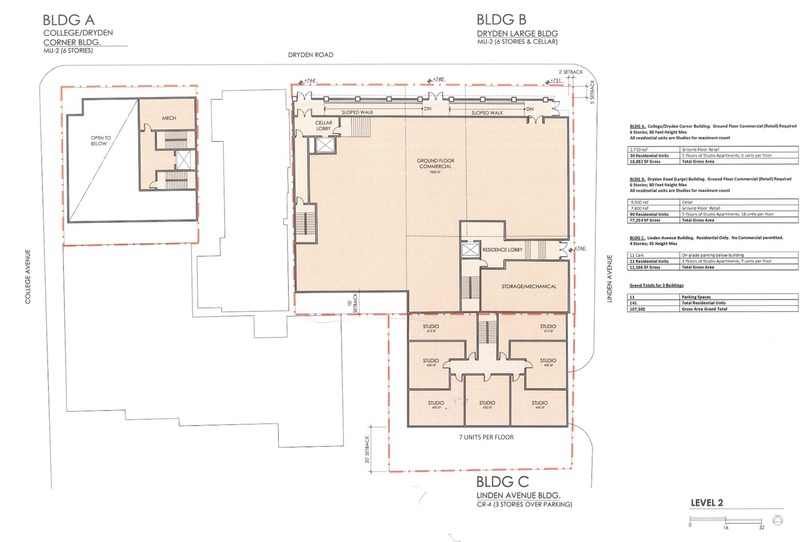 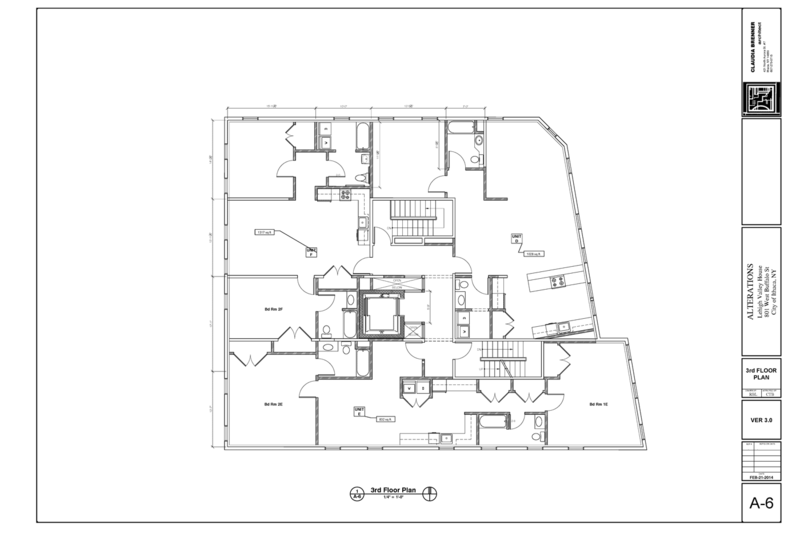 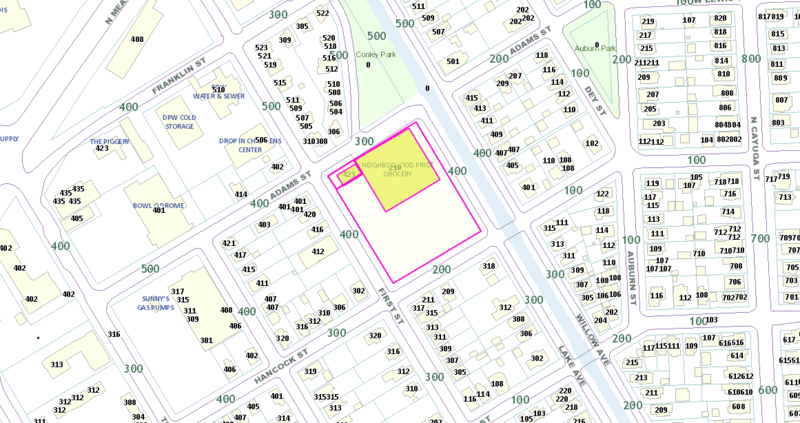 The total site is 90,530 square feet, zoned B-2a, so a re-development is zoned for mixed-uses (residential and commercial), with a maximum four-story (40 foot) build, and lot coverage of 50%, meaning that the full allowable space is over 200,000 square feet. 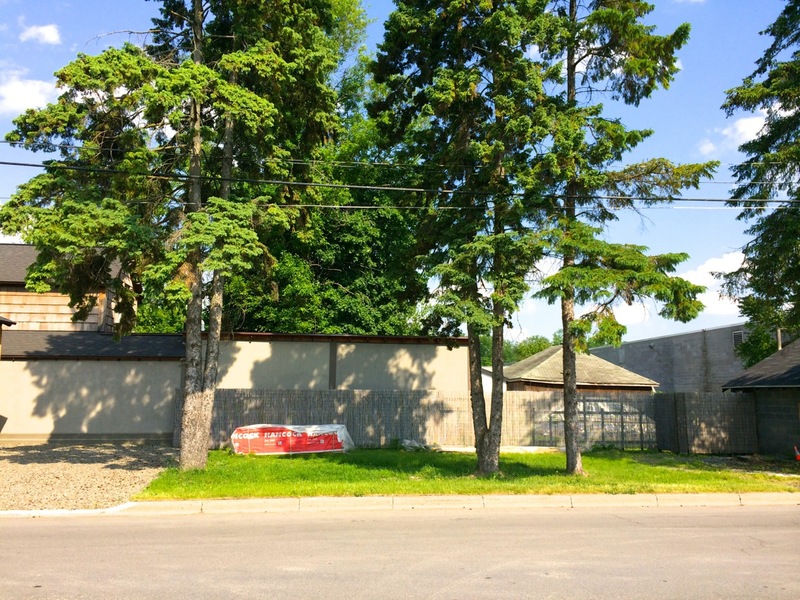 I’m not sure of the condition of the current buildings, but they don’t seem suited for residential conversion, so I would bet that a full demo and full site redevelopment would make sense here. 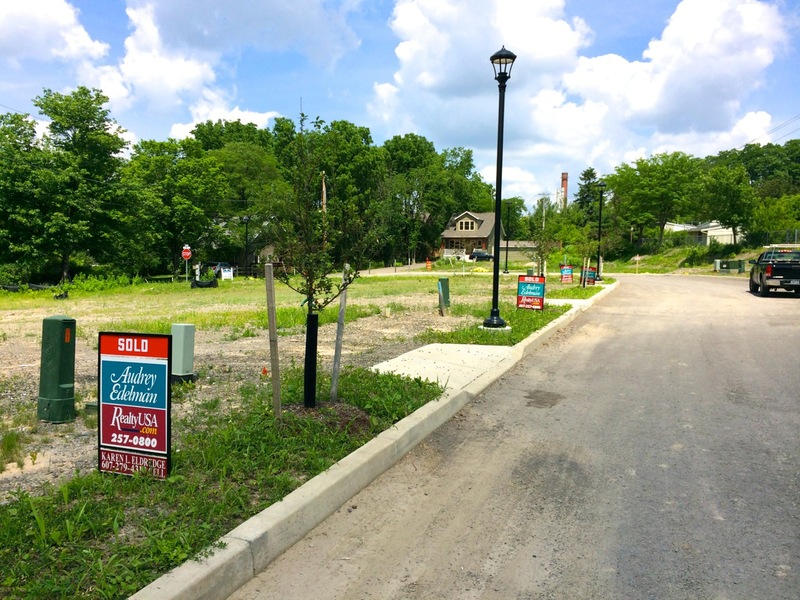 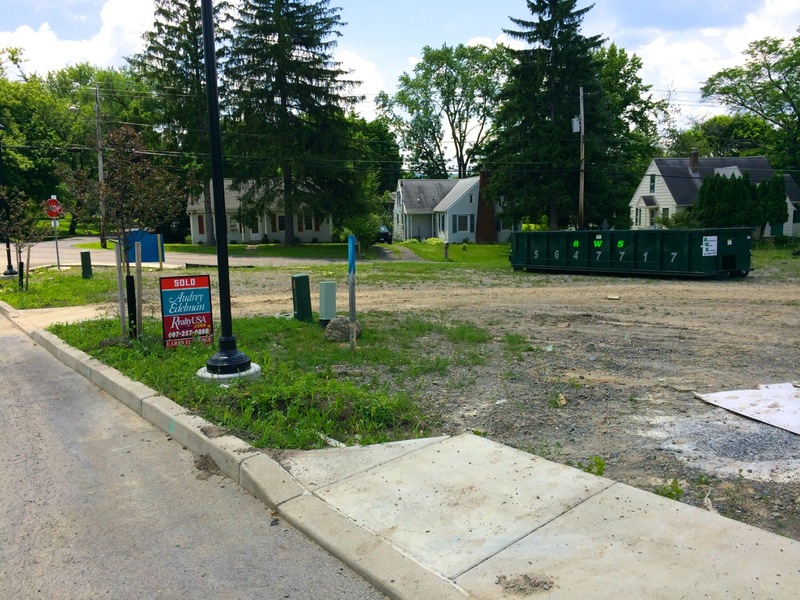 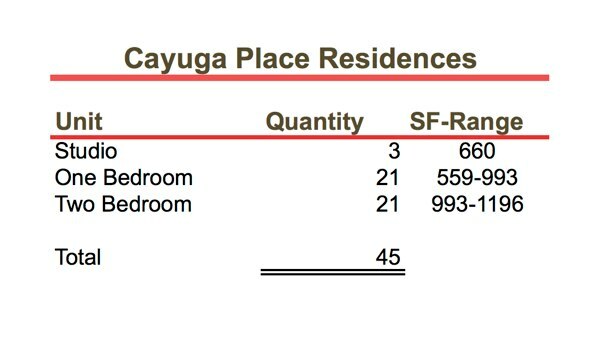 Given that the immediate area is Fall Creek, this will probably be the largest residential project done in the northern part of town since the Northside Developments were built in the 1950s, but there’s ample demand. 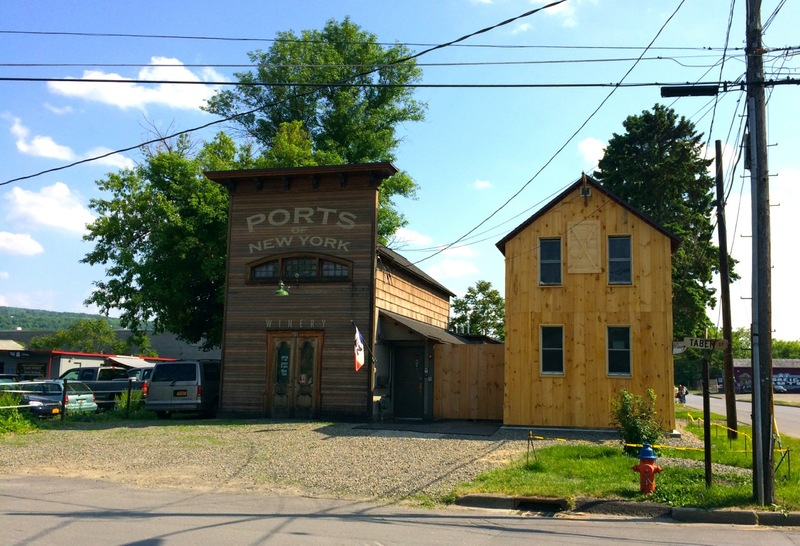 If you’ve never visited Ports of New York, head down to 815 Taber Street and try some unique wines Monday through Saturday, noon to 6pm. 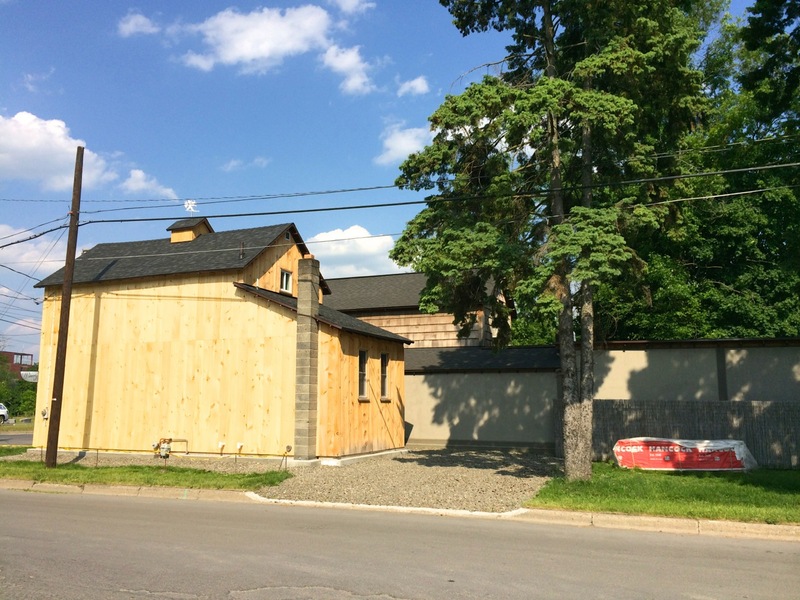 French winemaker Frédéric Bouché specializes in fortified wines, which are made by adding a distilled spirit, which halts the fermentation process, and creates a sweeter drink, with a higher alcohol content. 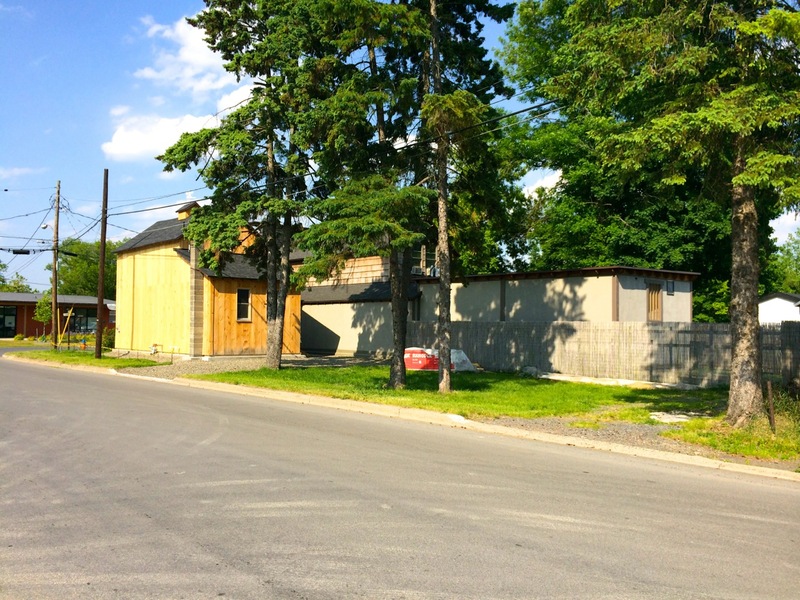 Frédéric built this facility about three years ago, and is renovating and re-siding the next door property for a residential rental. 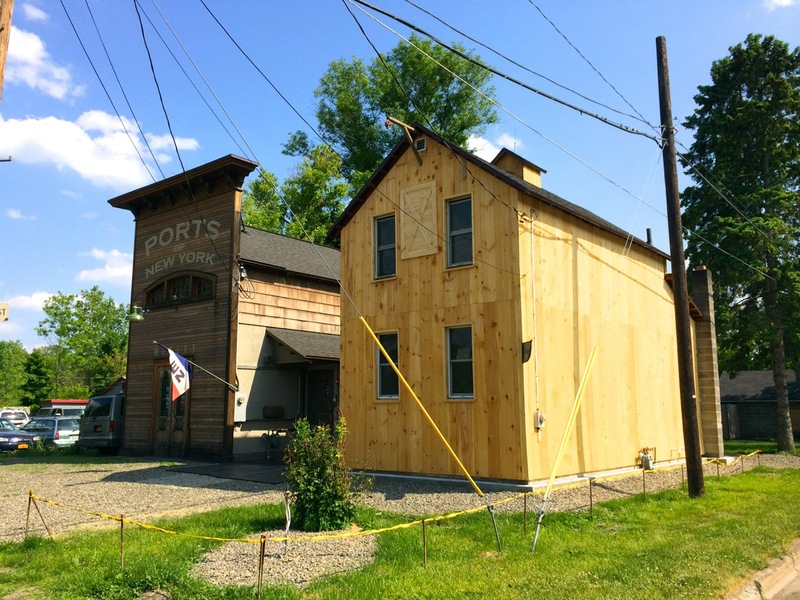 The original siding is cedar, and is being covered over with rough-sawn lumber, which will quickly age in the weather and blend into the same color as the Ports building. 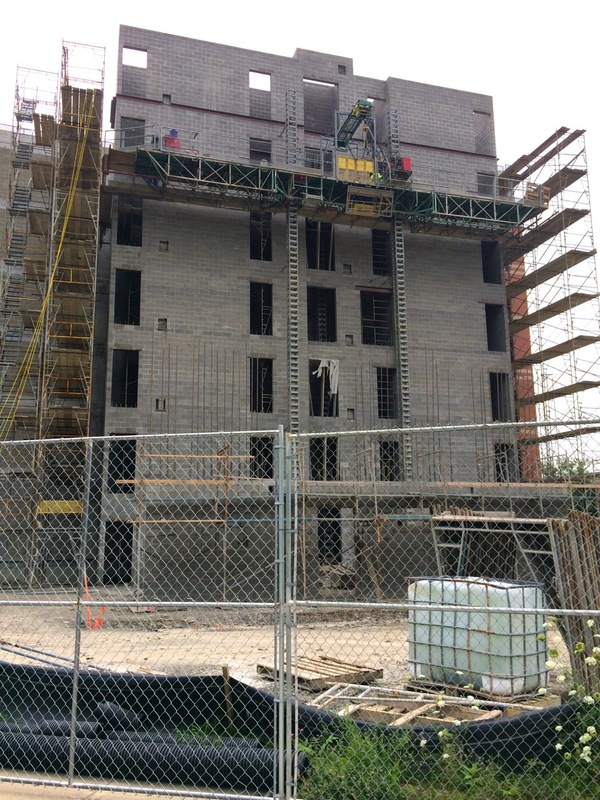 The foundation of the building had to be reinforced with concrete along the outside about two feet below grade, since the original foundation had been lifted improperly (many buildings in the area dating back further than the 60s have been raised due to past flooding). 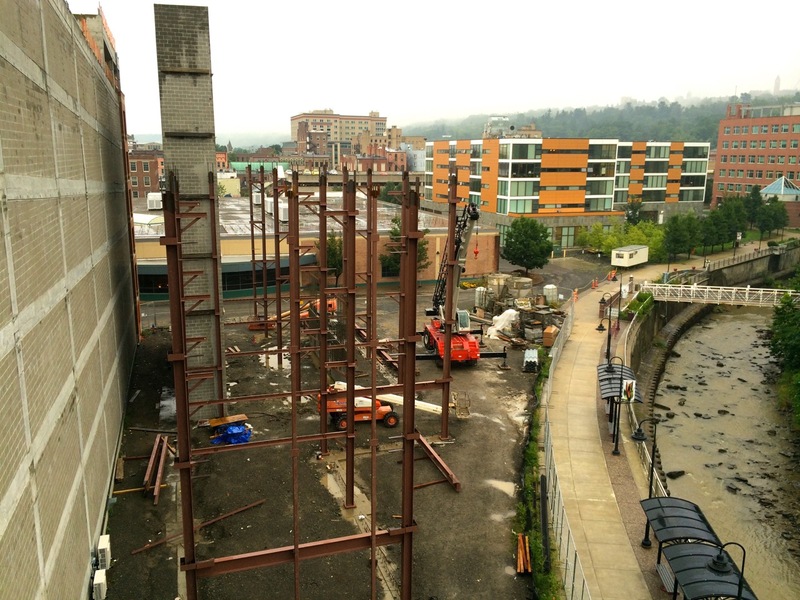 The backyard will be closed-in with vegetation this summer, and the Ports backyard will soon feature an L-shaped greenhouse connected to the existing garage for growing hydroponic grapes. 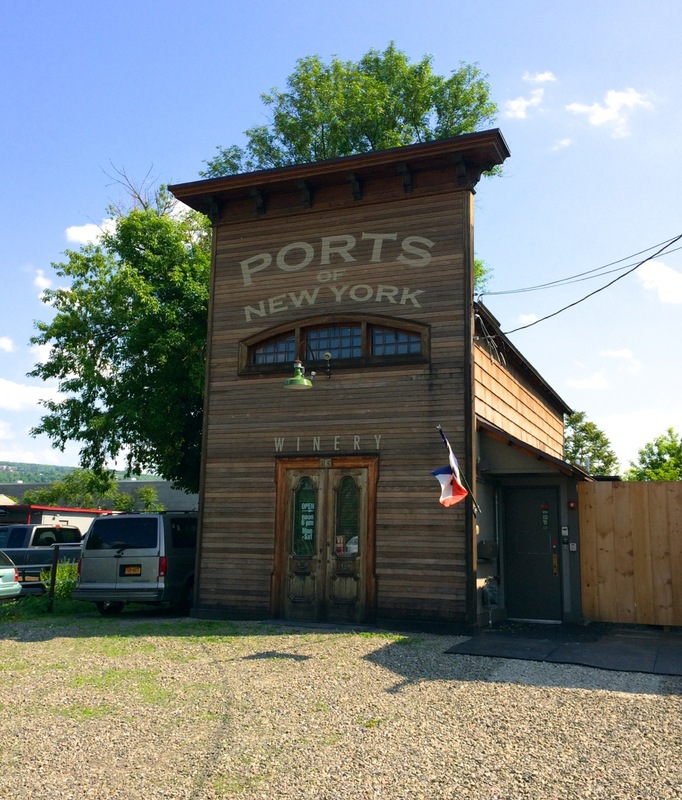 Check out Ports of New York on Facebook, and here’s the main website page with tasting, purchasing, and restaurants that feature the winery’s products.